The Banyan Tree Ungasan has spectacular villas and views, but it's a pity that the F&B experience can't live up to the billing. We had two more nights in Bali, and after the excellence of the St Regis, the Banyan Tree Ungasan had a tough act to follow. Still, this property almost nonchalantly racks up the awards, and I was certainly excited to see how they’d measure up against the St Regis. AMEX Platinum Charge cardholders receive a two night stay at selected Mandarin Oriental and Banyan Tree resorts around Asia as part of their welcome package. This stay can be booked through the AMEX Travel Concierge at least one month prior to your arrival, and your reservation can be cancelled without penalty up to three days before arrival. 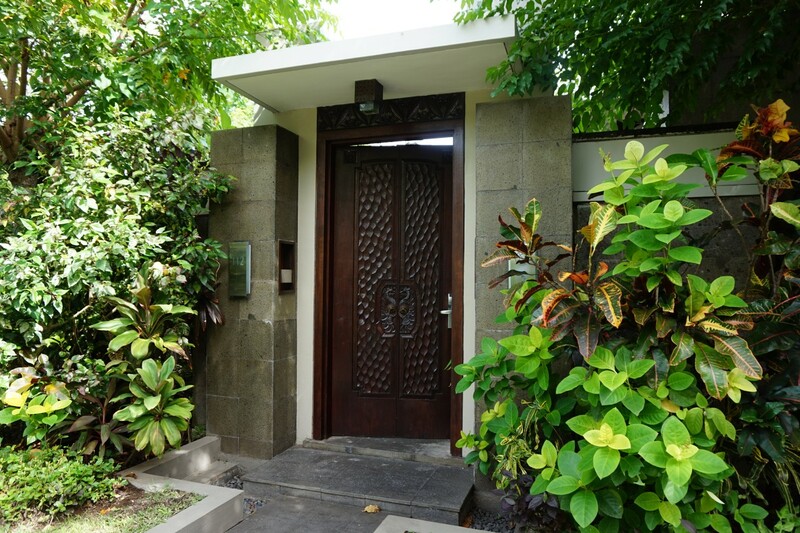 Of the 26 properties on offer, the one that caught my eye was the Banyan Tree Ungasan, with its massive villas and secluded location. 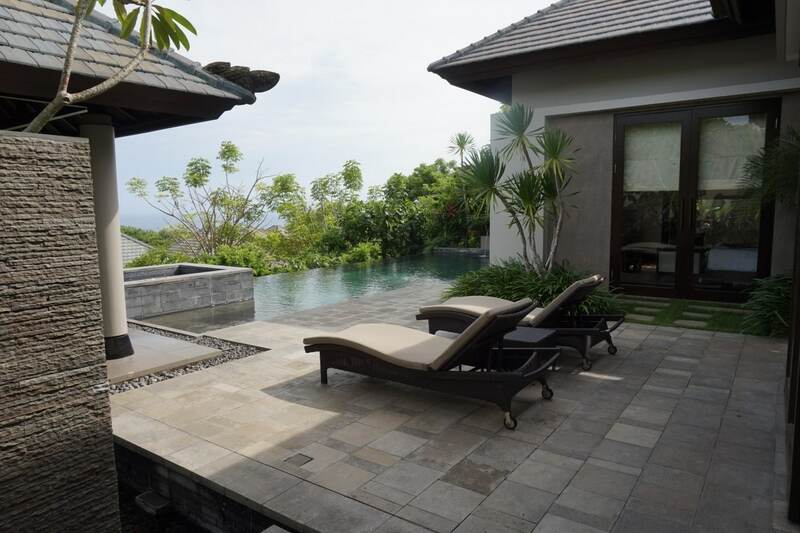 It fit perfectly into my plans for Bali, and after a few emails to the AMEX concierge, I was all booked and ready to go. Revenue rates for the dates I was looking at were US$870 per night, so I felt pretty good about the value I got from my certificate. 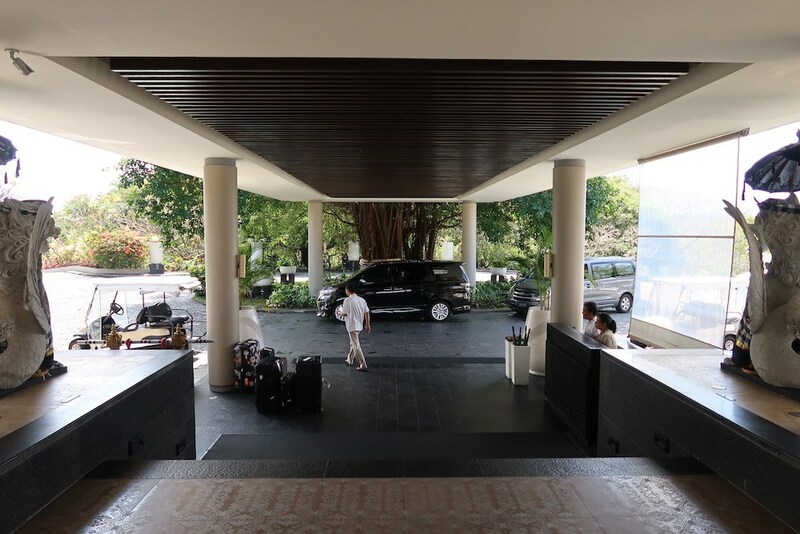 As mentioned in my review of the St Regis Bali, the hotel offers two-way airport transfers for all guests. 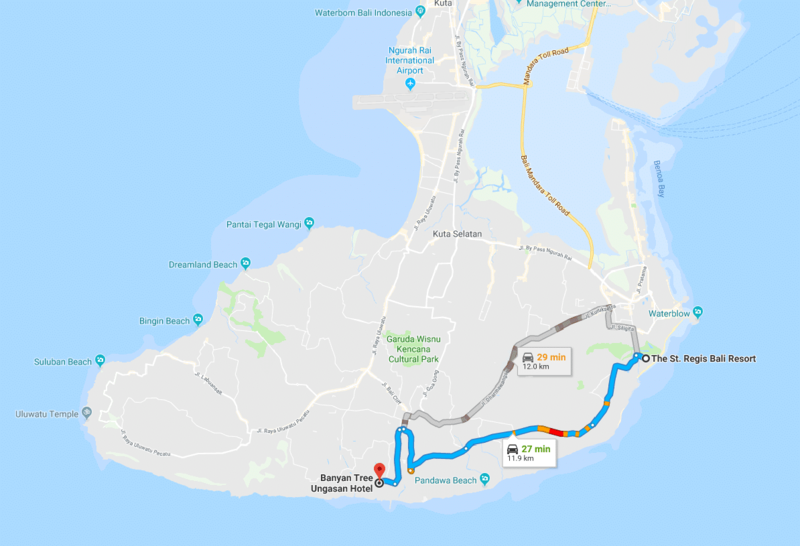 If you’re relocating to another resort after the St Regis, you can ask them to drop you off there instead. 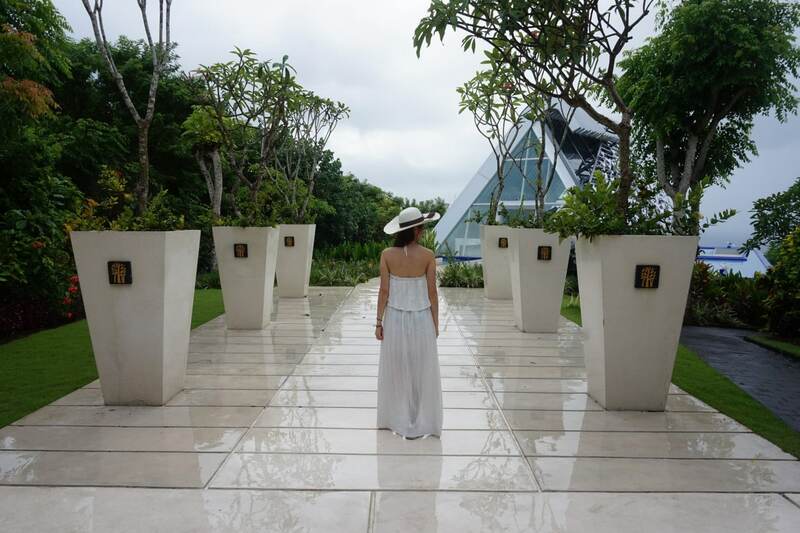 We left the St Regis around 2 pm for the 30 minute drive to the Banyan Tree. 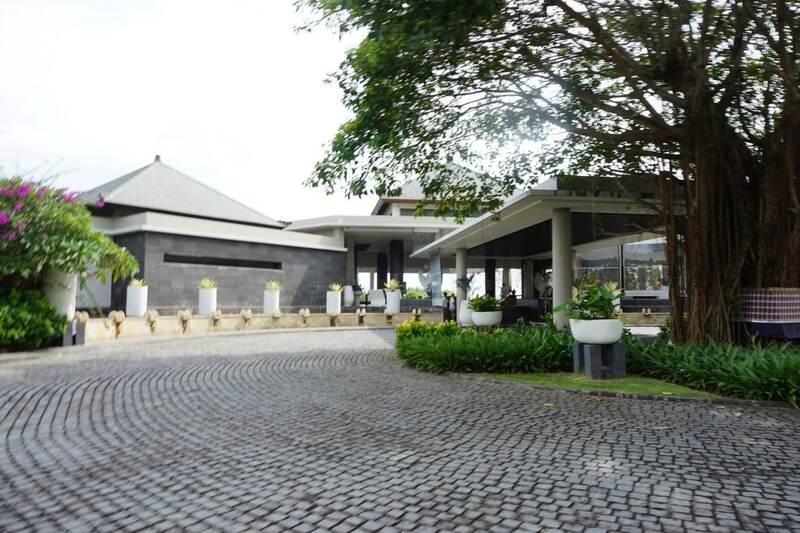 The Banyan Tree is located on the southernmost tip of Bali, in an area that really doesn’t have much development. 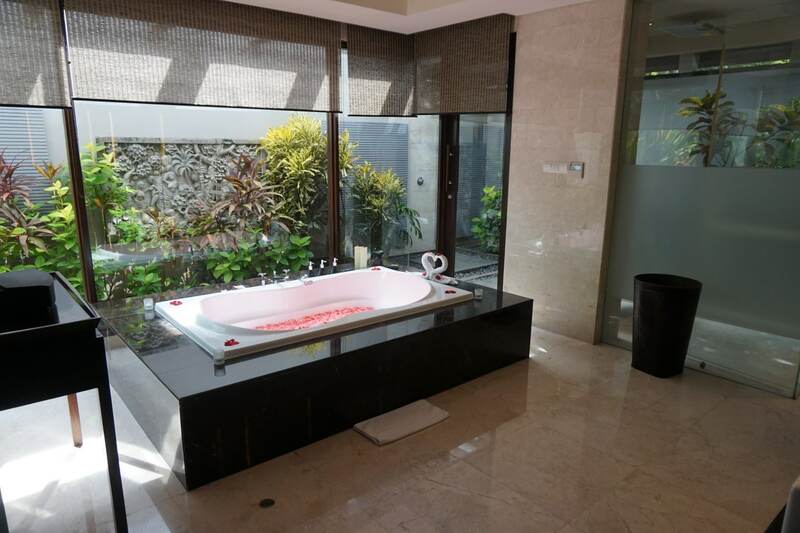 If you thought Nusa Dua was remote, wait till you get a load of Ungasan. 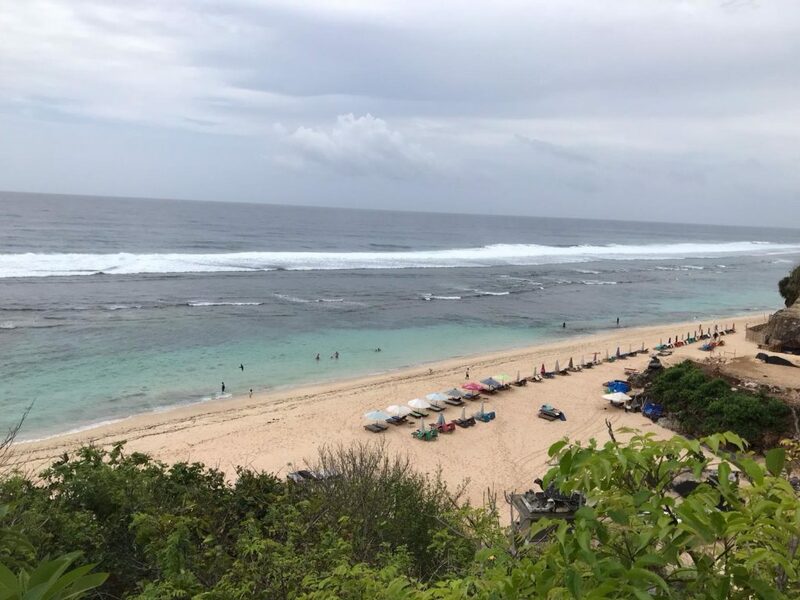 I’d never even heard of the area until I booked the hotel, and from the drive in you could tell that this was a part of Bali that tourists didn’t frequent- few restaurants, massage places, even convenience stores were in short supply. 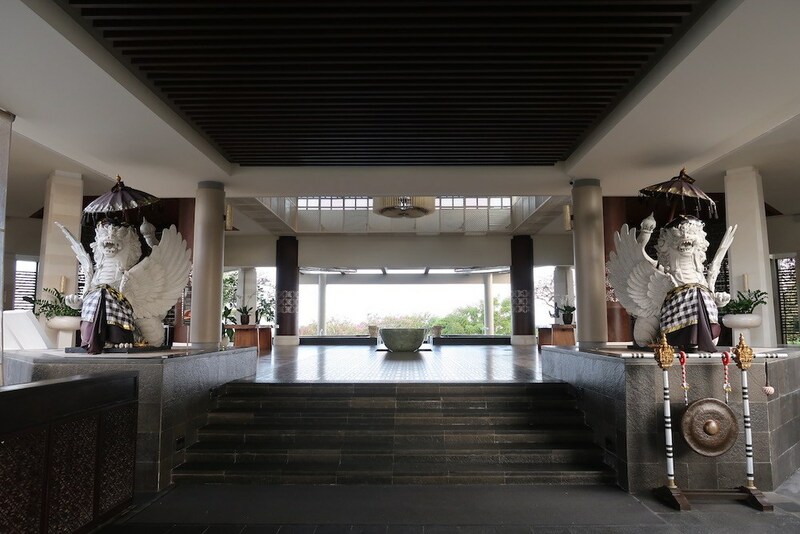 The hotel is located at the top of a hill, so you’ll drive up a fairly steep incline from the main gate security checkpoint to the reception area. At reception, we were warmly greeted by a check-in associate who took our passports and invited us to take a seat while the formalities were done. The lobby wasn’t as impressive as the St Regis, but it was still a bright and open space with plenty of natural lighting. 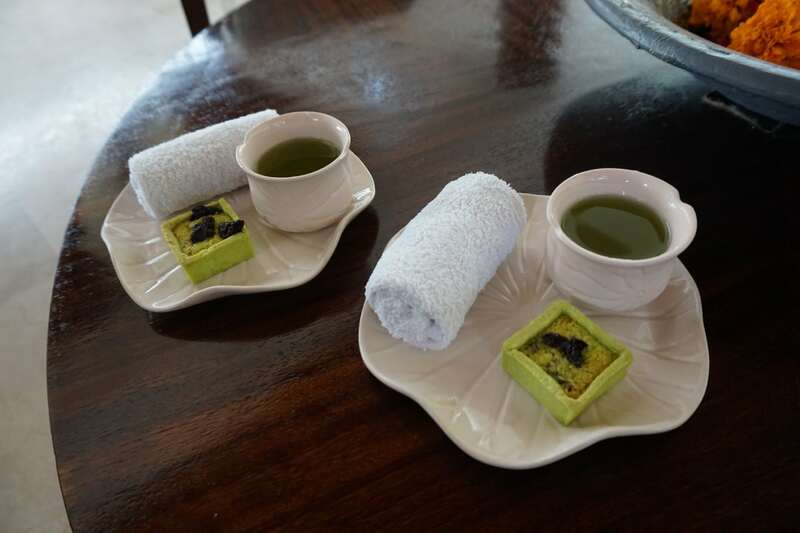 While waiting, green tea, a cold towel and a pandan cake were served. Redemption letter…? And here’s where it dawned on me what a colossal idiot I was- I’d left the voucher in my desk back in Singapore! A wave of panic swept over me as I recalled what the AMEX concierge had repeatedly told me when I was booking. Was I now on the hook for a US$870 a night stay? Did I need to get the original voucher FedEx-ed from Singapore? Could I print out a realistic-looking color copy and pass it off as the original? And why on earth did we need the original voucher anyway? I told her that I didn’t have the physical copy with me, and asked what we should do. She wrote down an email address and asked me to send my scanned copy to her. She said she’d check with her manager and let me know if it was acceptable, but I never actually heard back. 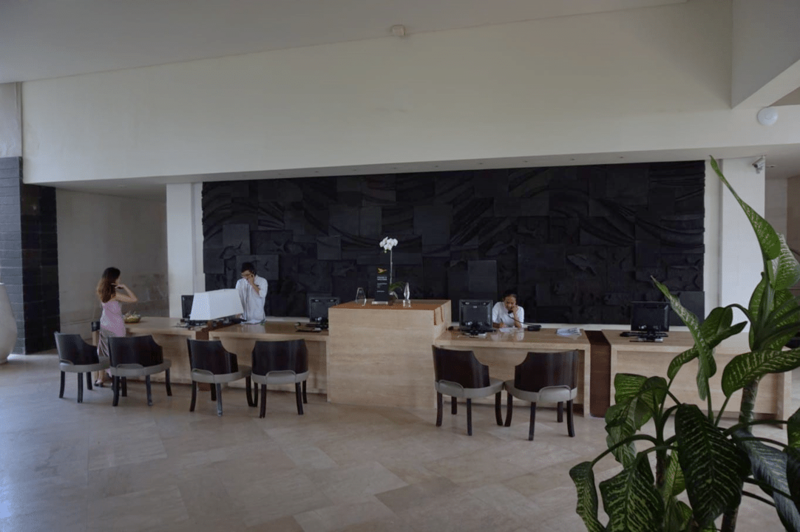 On the second day I dropped by the front desk and was told everything was a-ok. I’m sure this varies from property to property, and I’ve heard of some that don’t even ask for the letter, but I’d still advise you not to try your luck. Crisis averted, we returned to the driveway to head out to our villa. As we boarded the buggy, the staff asked us which bags were ours. This innocuous question was kind of a microcosm for the overall service experience at the hotel- I didn’t really care that they asked, but this would be something the staff at a slightly better resort would have noted and remembered automatically when we arrived. 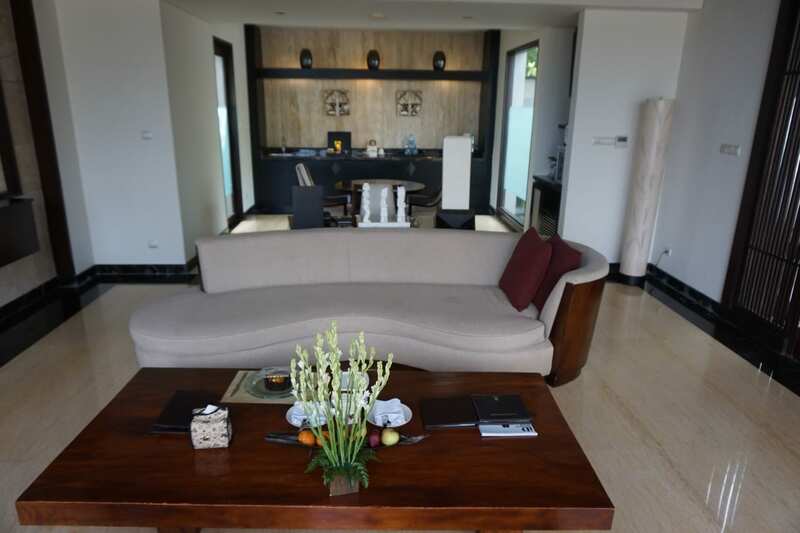 The Banyan Tree Ungasan is an all villa property. 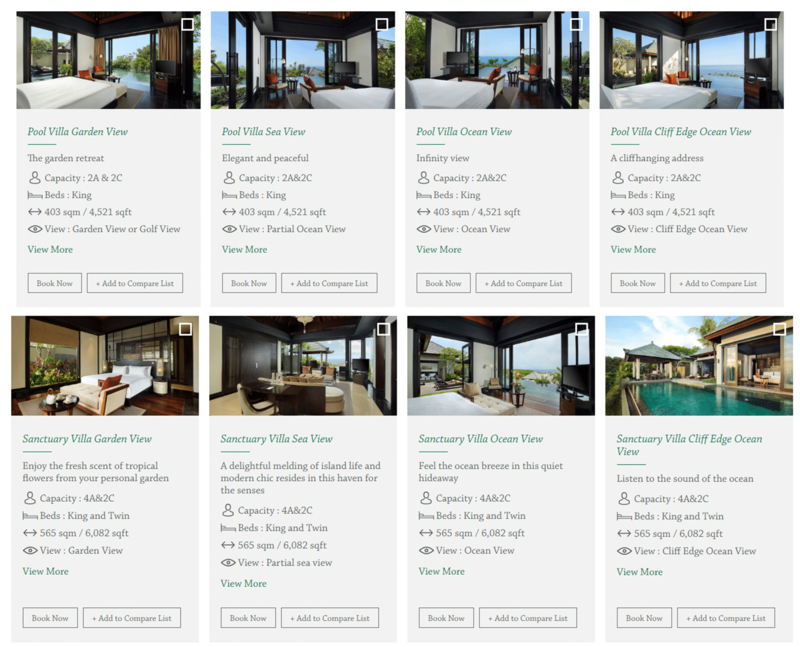 Technically, there are eight different kinds of villas, but if you look closely at the specs you’ll see that there are really two types (Pool vs Sanctuary villa), just with different views. Those are really steep prices to pay, especially when you consider the fact that it’s still the same sized villa, just with a better view. 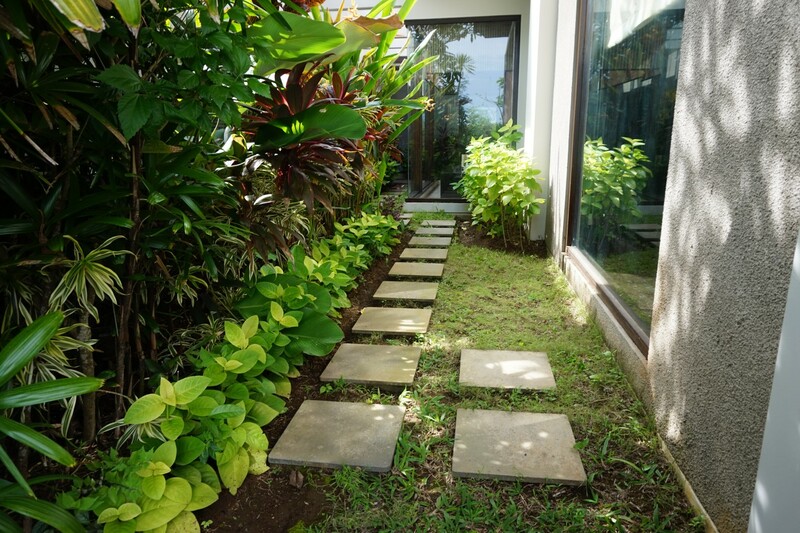 My main concern was privacy, not so much the view, because the tiered arrangement of the property could allow elevated units to peer down into those below. 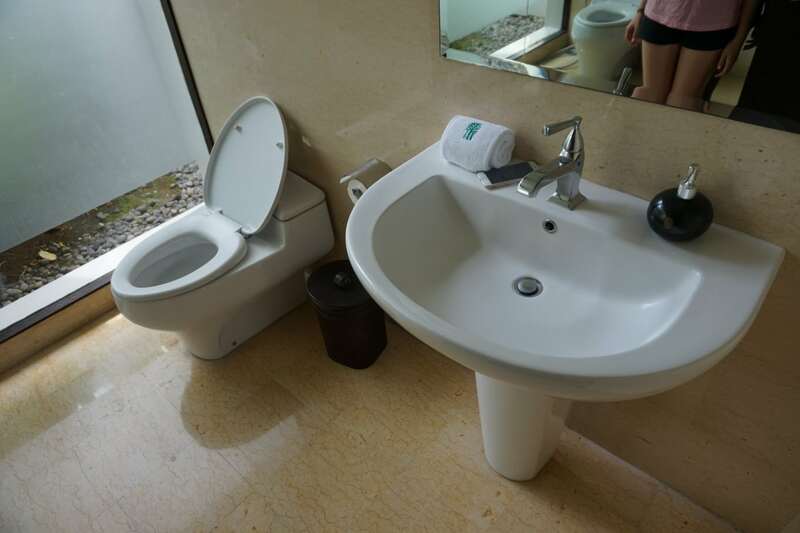 In the end I’m glad I didn’t spring for an upgrade, because the villa we were assigned (112) was high enough to guarantee privacy. I’m not actually sure if 112 counted as a view upgrade, however. After a couple of minutes traversing a winding and sloping pathway, we pulled up at the entrance to the villa. 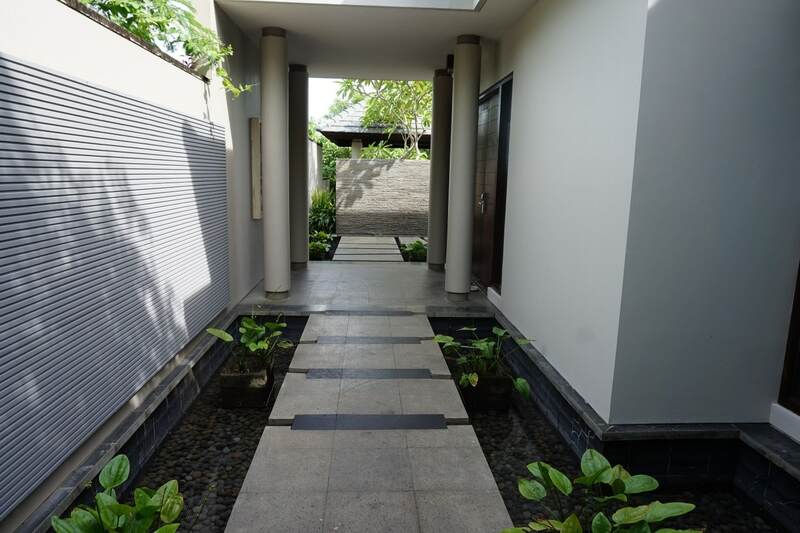 Once you step through the outer doors, you enter a small courtyard that leads you to the villa (on the right) or to the pool (straight on). 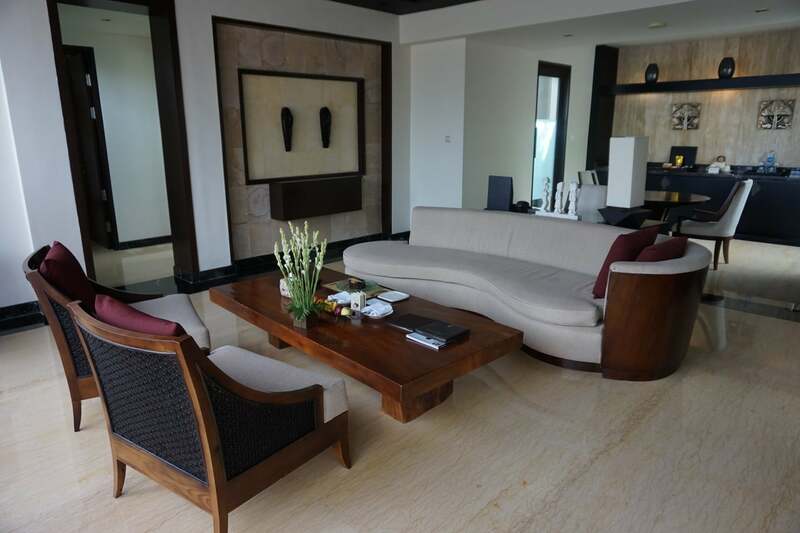 At 403 square meters, the villas at the Banyan Tree are roughly the same size as the St Regis Bali. 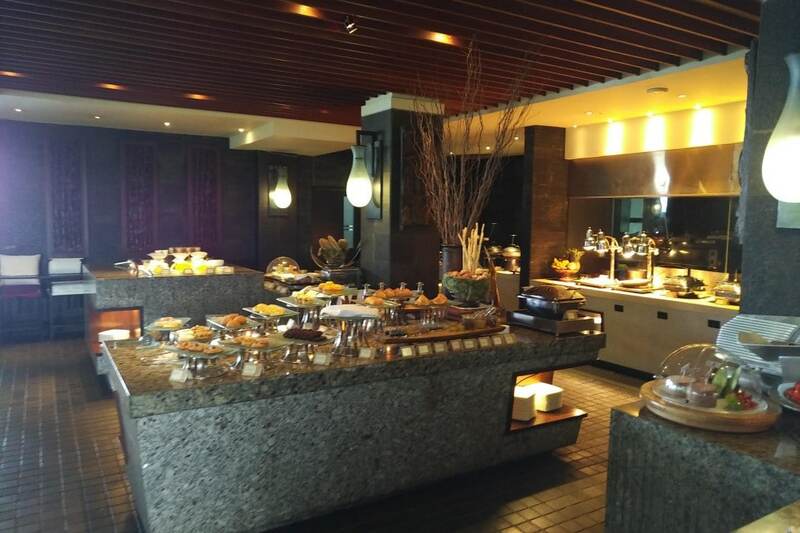 Although the St Regis probably wins for luxury, the interior of the Banyan Tree felt much more spacious. 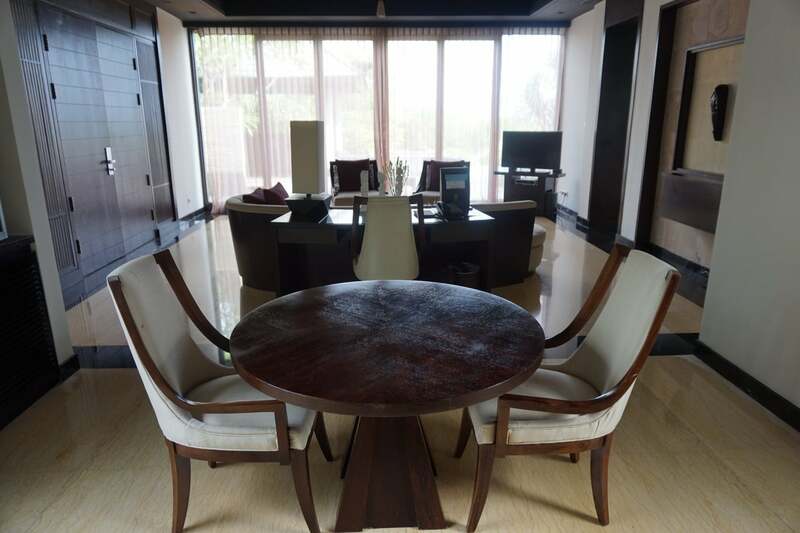 The living room featured a dining table and large work desk. However, the phone was almost unusable thanks to a very loud crackling sound. Given that you need to call for a buggy to get almost everywhere, the phone is your lifeline to the outside world. It was a bit annoying as both sides had difficulty hearing one another. 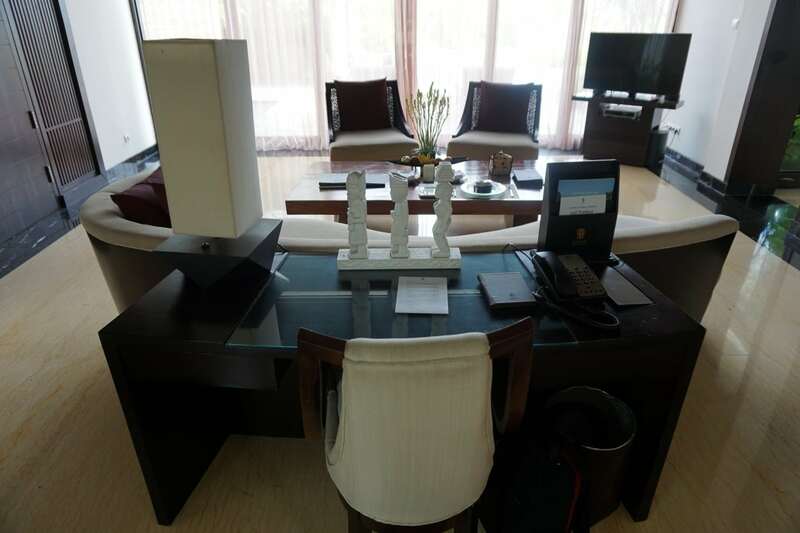 There’s a long wet bar in the living room, which features the obligatory coffee machine, mini-bar and tea set. 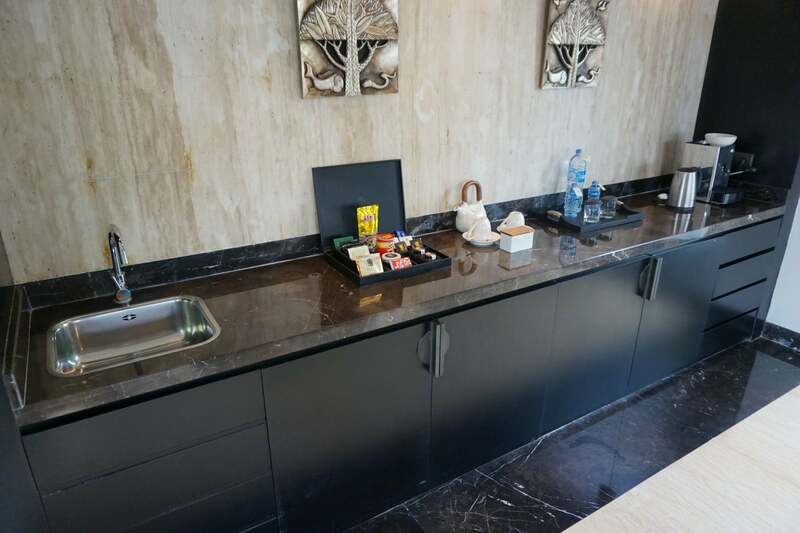 You can have all the bottled water you want for free, but drinks and snacks from the mini-bar will cost you. 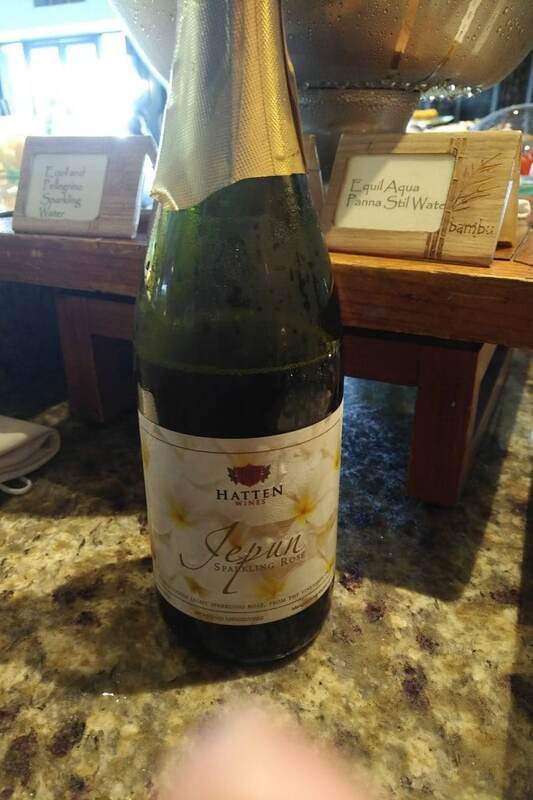 The prices are typical resort standard- S$7 for a coke, S$73 for a bottle of locally-made sparking wine. 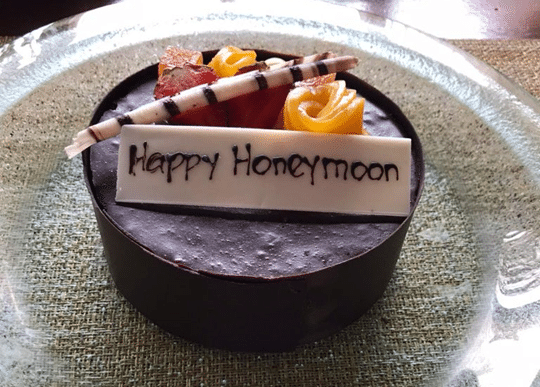 The property had provided a chocolate cake to mark our honeymoon. 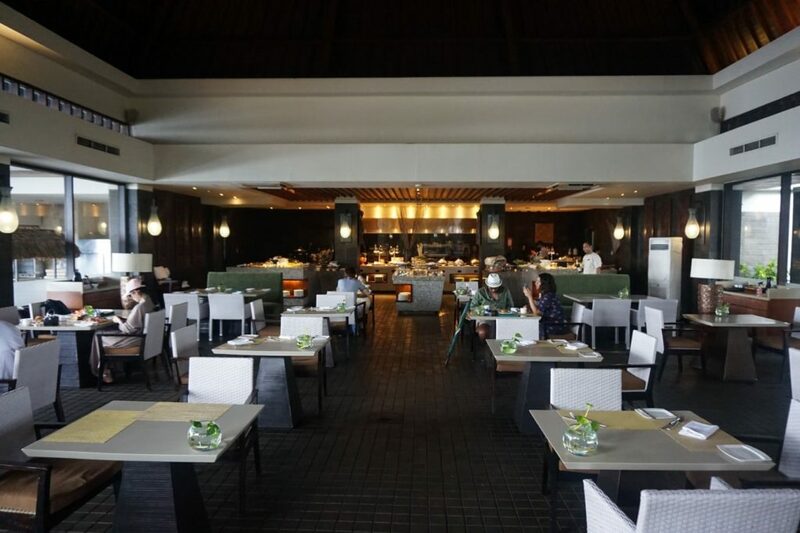 I was a bit surprised that neither the St Regis nor the Banyan Tree offered a bottle of wine to celebrate the occasion, but that might be because alcohol in Bali is so expensive. 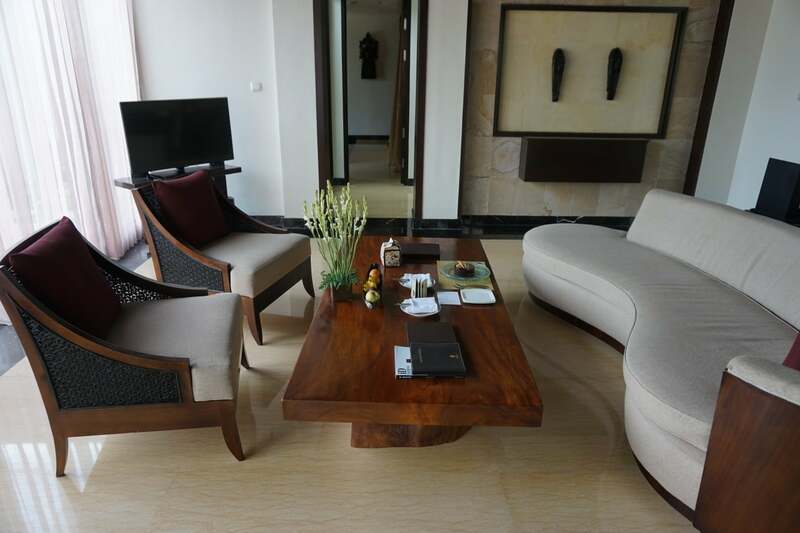 The living room has its own guest bathroom attached, which you’ll find in the small passageway to the master bedroom. 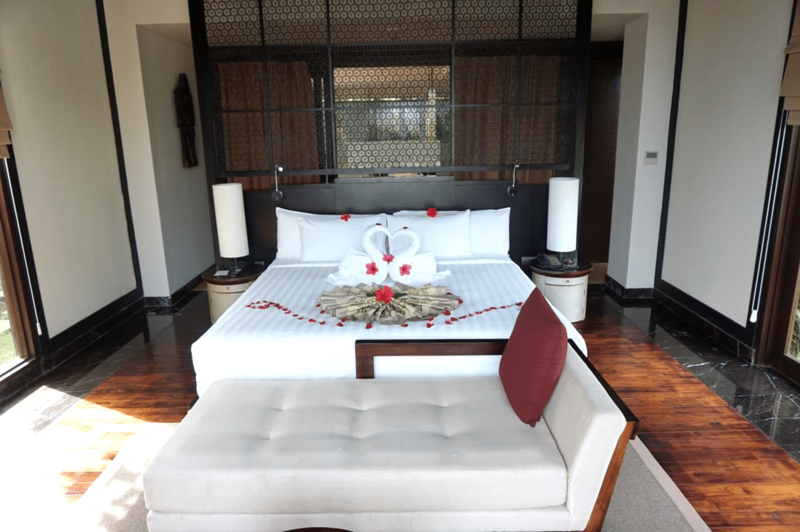 The master bedroom features a King sized bed, a high, arched ceiling, and looks straight out to the pool. The best thing about the bedroom is there’s direct pool access. Just step out the window and you’re on a shallow ledge that’s perfect for soaking your feet. You’re going to want to keep the doors closed though to avoid getting mozzies in the bedroom. 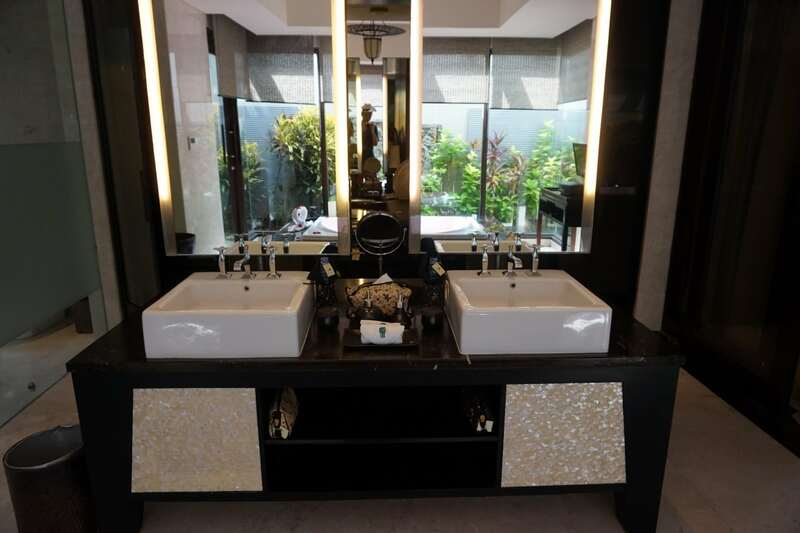 I mentioned that the bathroom in the St Regis was large, but the one at the Banyan Tree would give it a run for the money. 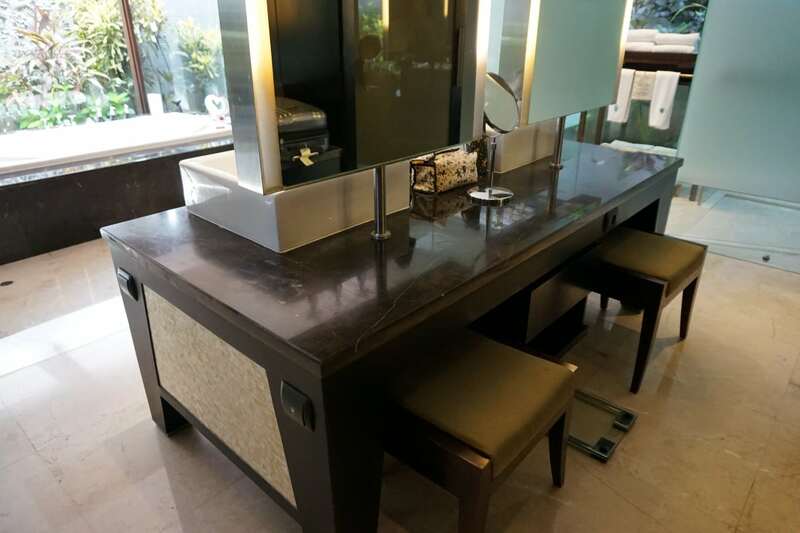 The Milelioness liked the fact that on the reverse side of the sinks was a large dressing table area, something that the St Regis lacked. 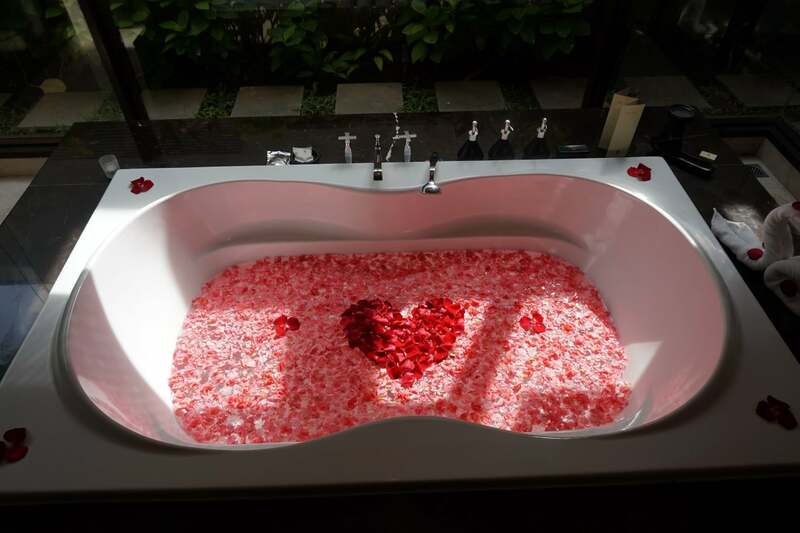 The large bathtub was filled with rose petals, and the staff had also provided candles and matches. 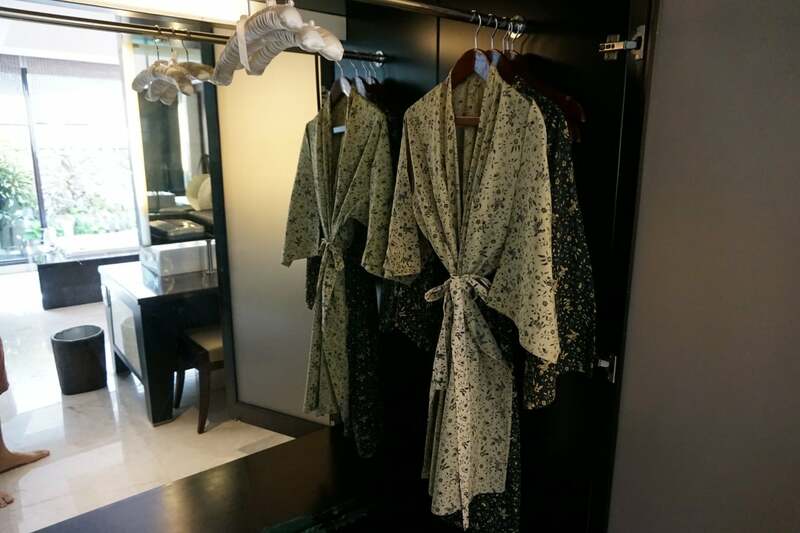 A pair of nicely designed bathrobes were found in the wardrobe. 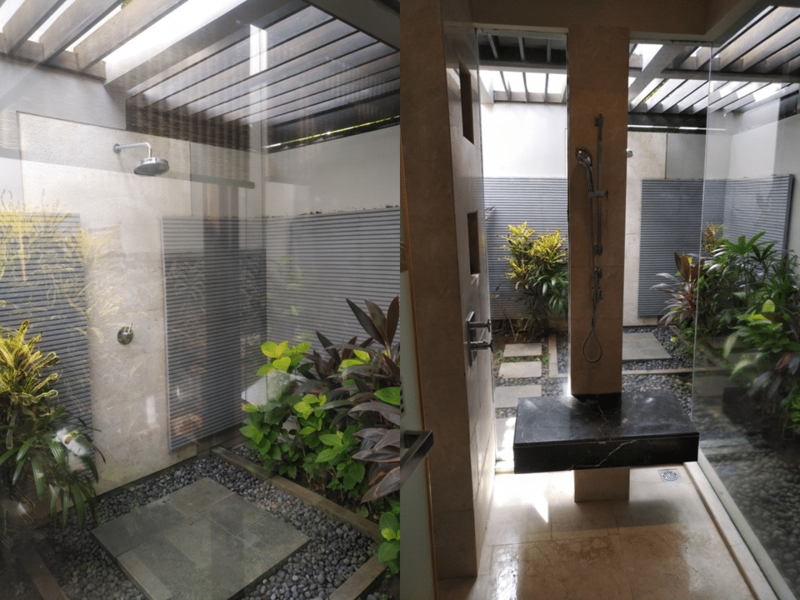 The bathroom features both an indoor and outdoor shower. I loved that the indoor shower had a bench, which not nearly enough hotels have. It makes soaping your feet a lot easier, an minimizes the odds of you ending up in the hospital with a shower-related slip and fall injury. It was also large enough for two, which makes it really easy to play Monopoly Deal with a partner. The shower amenities were placed in generic bottles labelled “shampoo”, “conditioner” and “bath gel”. 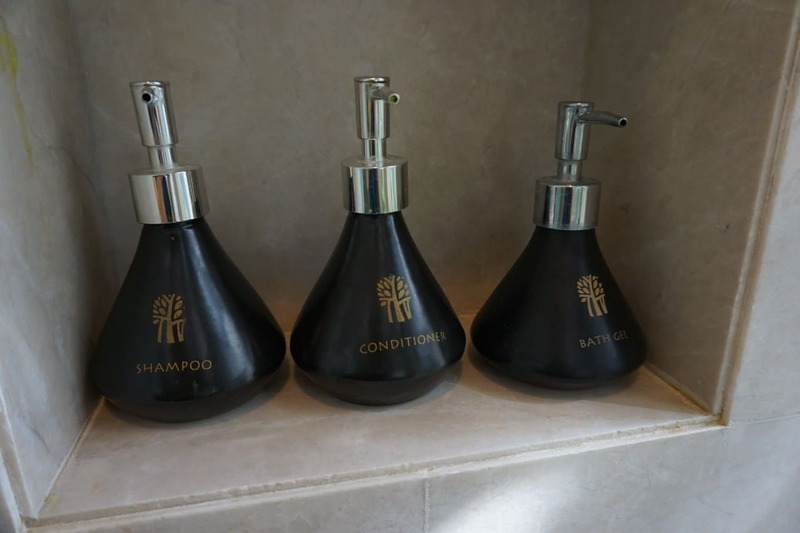 I suppose the property was trying to be eco-friendly by reducing the amount of plastic waste generated, but I thought it might be nice to at least let the guests know what brand of toiletries they were using. 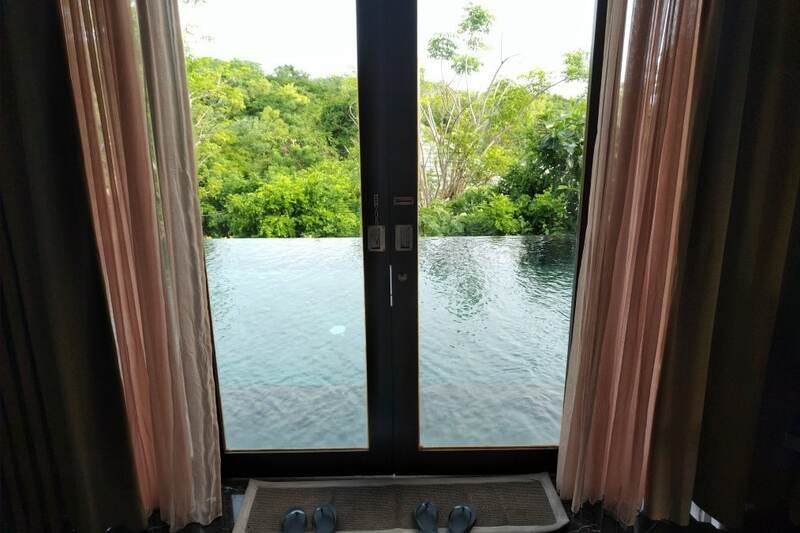 Just like at the St Regis, the Banyan Tree also had a side passage to the bathroom, which allowed you to traverse between the pool and shower without wetting the entire villa. You’ll get your feet dirty in the process, though, as the tiles are quite muddy. 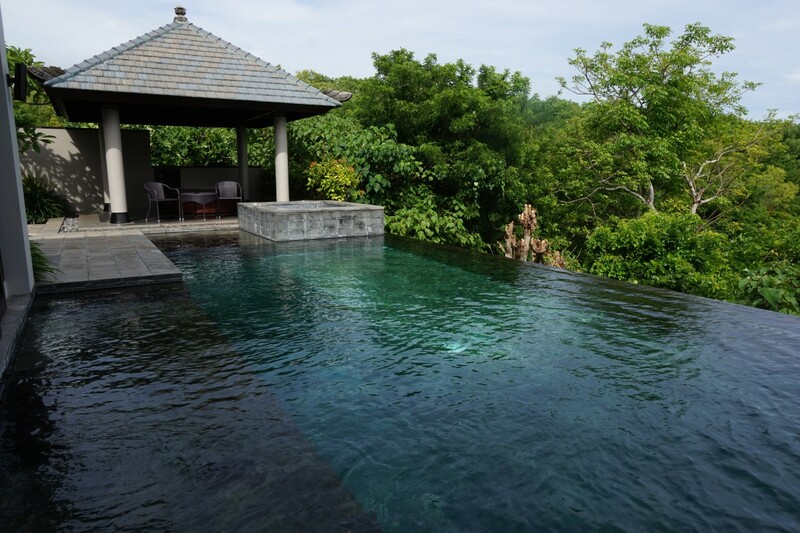 The hero of the villa is undoubtedly the 10 metre infinity pool, which comes standard with every room. This pool has the St Regis beat for sheer size. It’s long enough for lap swimming, and the lack of overhanging foliage means clean water. 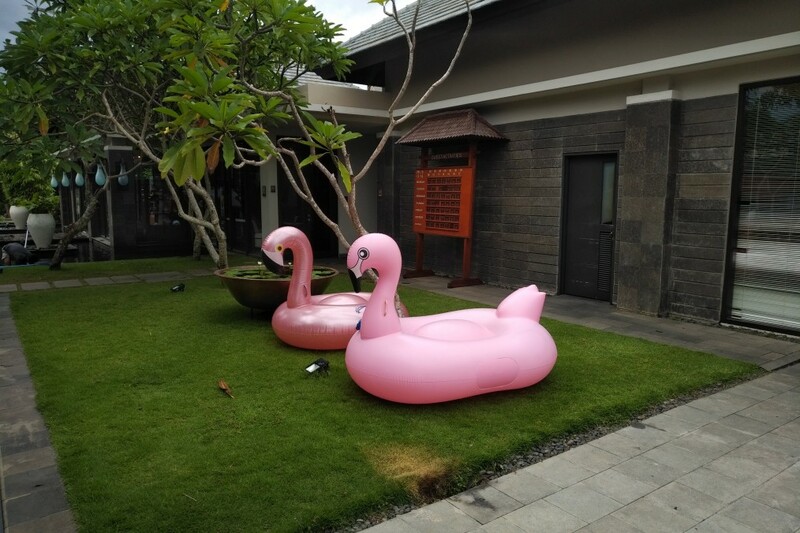 We brought our own pool floats, and the staff were happy to inflate (and upon departure, deflate) them for us. 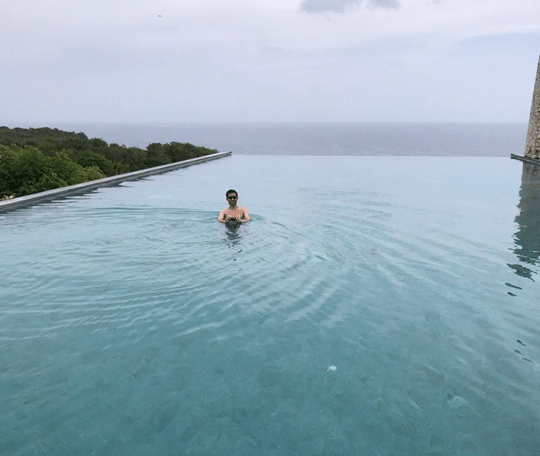 We much preferred this pool to the one at the St Regis, although unfortunately we had to deal with mosquitoes in the evening. I think that’s kind of a fact of life in a place like Bali. Also, since the resort was facing South there was no chance to watch the sunset or sunrise from the pool (unlike the Conrad Koh Samui). 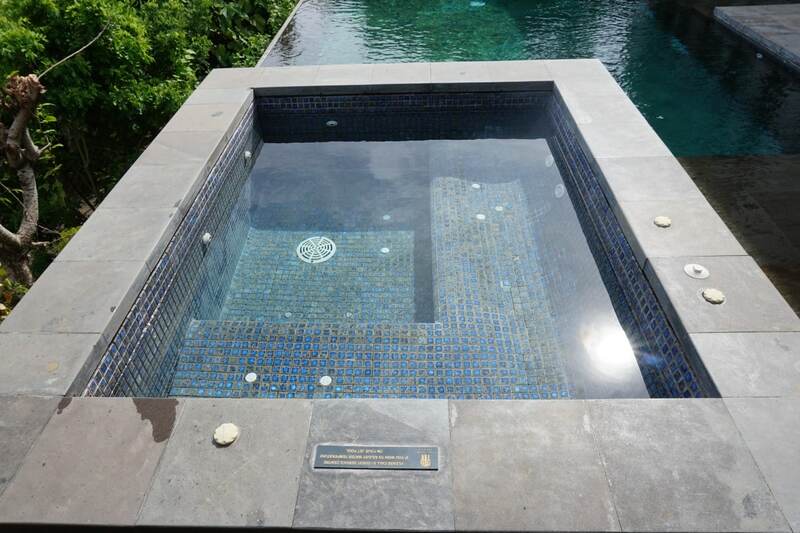 The pool features an outdoor jacuzzi where the water is significantly warmer than the pool. It’s perfect for those who dislike the cold, and we found that we could even sit outside in (light) rain and not feel chilly. 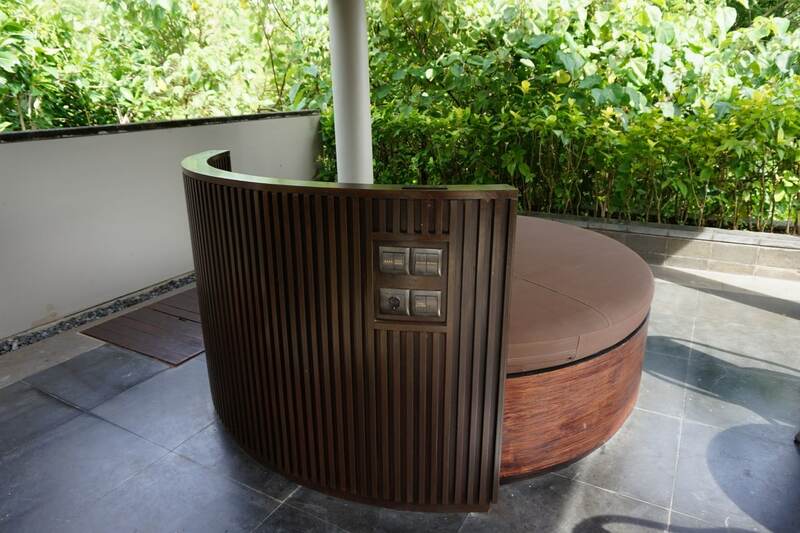 There’s an outdoor sheltered hutch with a day bed, which is also where you’ll find the buttons to control the jacuzzi. One interesting feature about this property is you could request an outdoor BBQ to be set up in the hutch, but be prepared to pay dearly for the privilege. 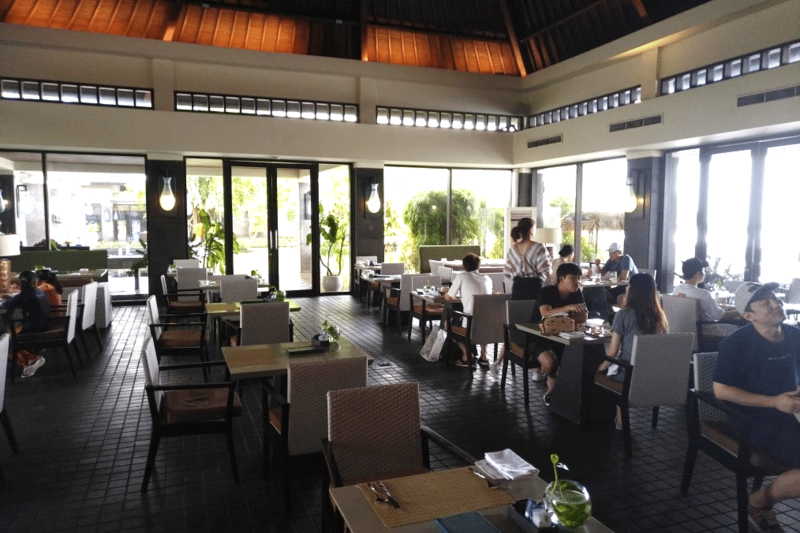 Much of whether you enjoy the Banyan Tree Ungasan depends on whether you fancy the dining options. After all, this isn’t Kuta; this isn’t even Nusa Dua. This is Ungasan, where you can’t exactly call a Gojek and pop into a nearby restaurant if you don’t like what’s on offer. Sadly, I didn’t find the dining at the Banyan Tree anything to shout about. 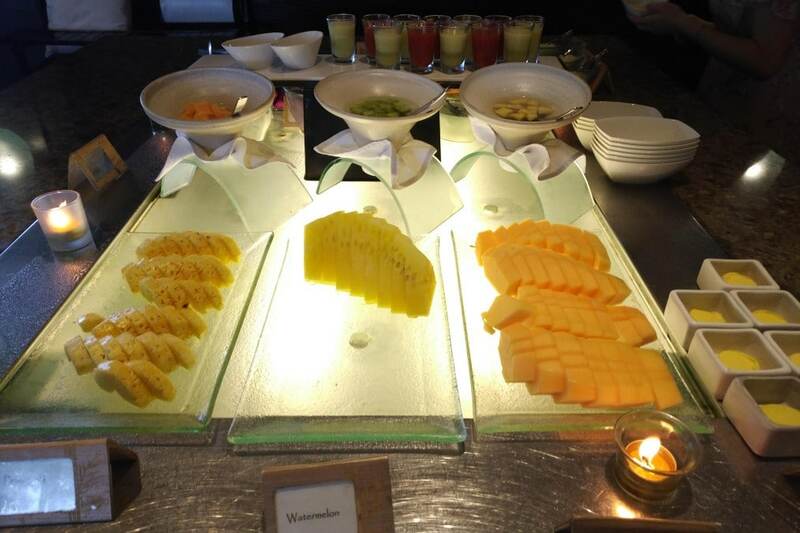 Breakfast is served from 0630 to 1100 daily at Bambu, next to the pool. 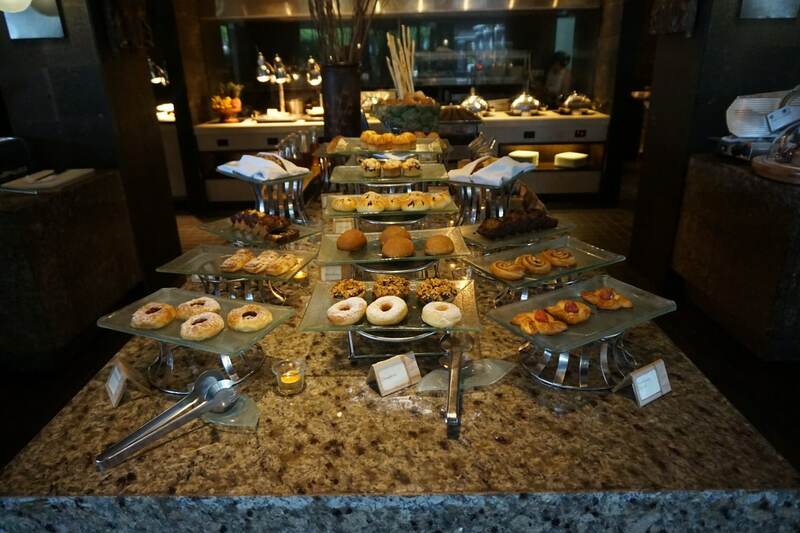 Just like at the St Regis, you’re able to choose from both a made-to-order menu as well as a buffet spread. The food wasn’t bad by any means, it was just average. But in a place that charges US$870 a night, average isn’t good enough. I thought the flavour and presentation were somewhat lacking. 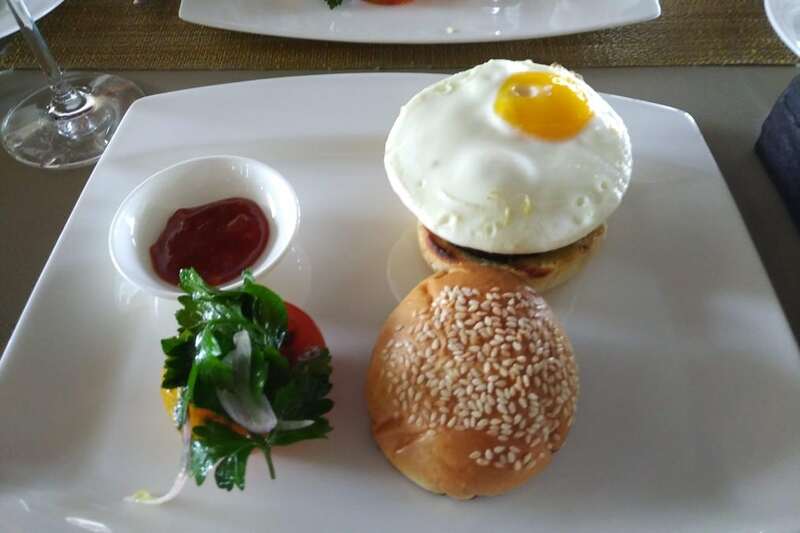 …you see that it’s a very unappetizing mess of greyish eggs served on soggy toast. 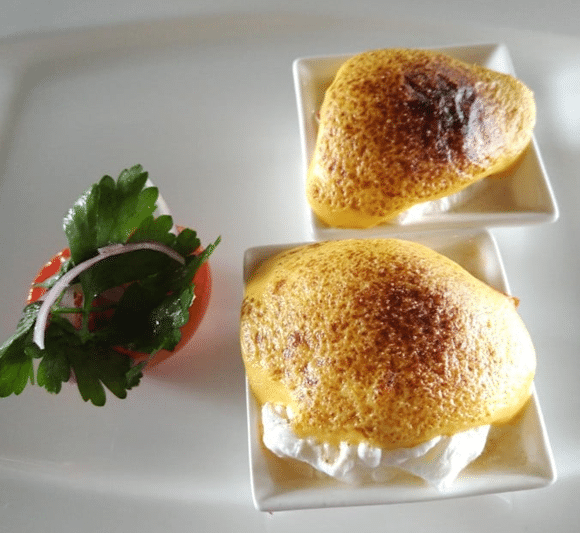 The lobster pieces were virtually non-existent, and although truffle improves everything, this dish still couldn’t hold a candle to the lobster omelette we had at the St Regis. …or the salmon rillettes with caviar and quail egg (the salmon was pulverized and more reminiscent of cat food). 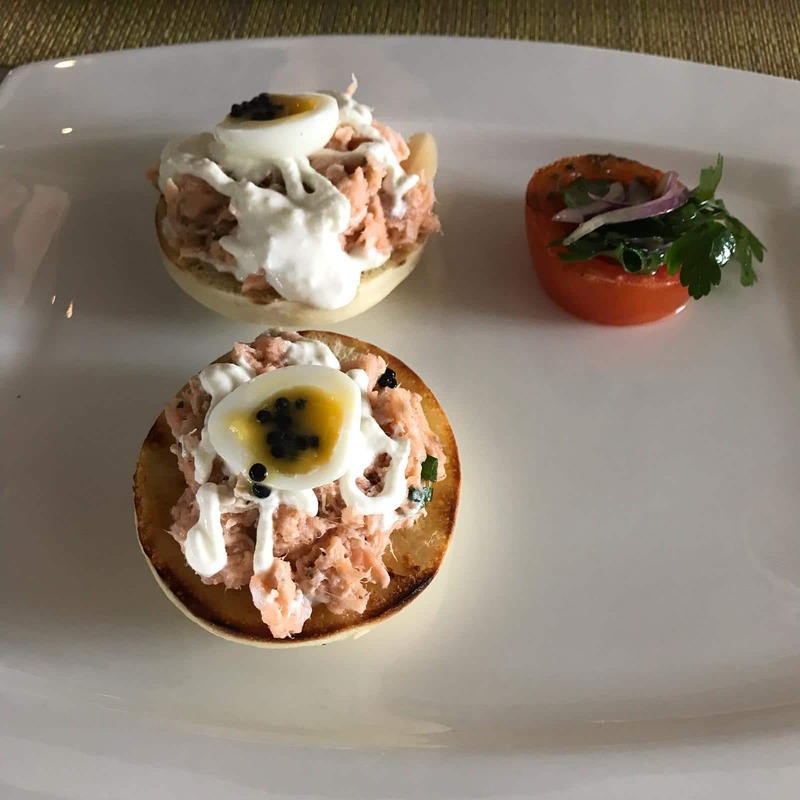 The scallop fricassee and poached eggs sounded promising in the menu, but just as was the case with the lobster scramble, the scallops were nowhere to be found. The banana waffle came with chocolate ice cream as standard, which I thought was a bit of a strange choice. 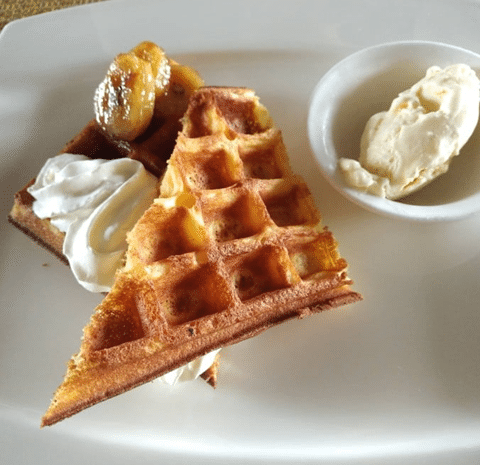 I much prefer vanilla ice cream with my waffles, and asked the staff to make the substitution, which they happily did. I was kind of hoping the next morning they’d remember us and make the same substitution automatically, but no such luck. 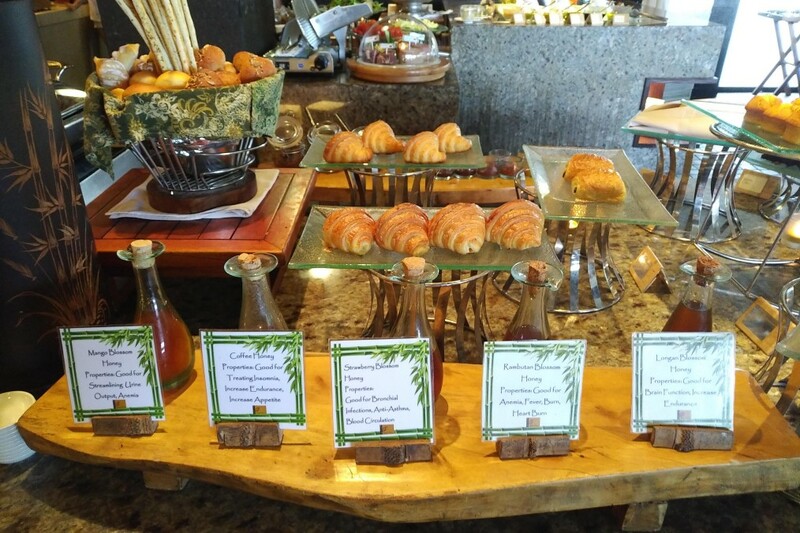 Again, this didn’t bother me, but I’ve been to other resorts where the staff remember your breakfast preferences from day one, right down to whether you want sugar in your coffee. The pancakes were on the heavy side and not at all fluffy. 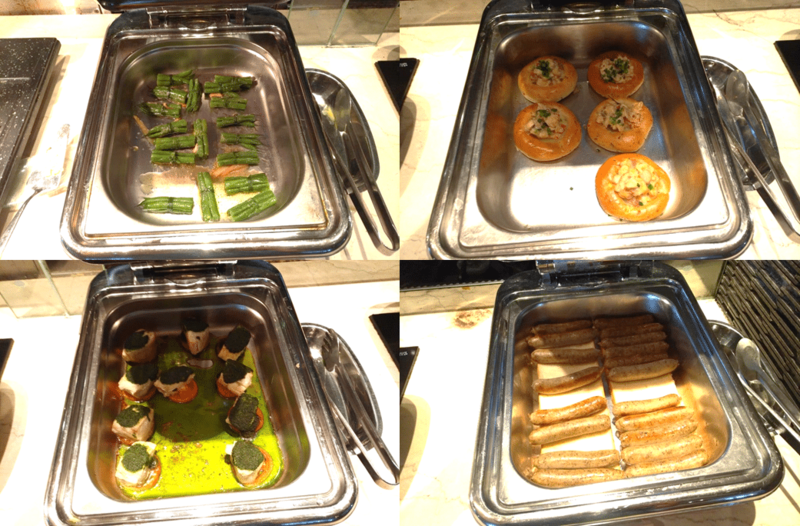 Here are some snapshots of the rest of the buffet. 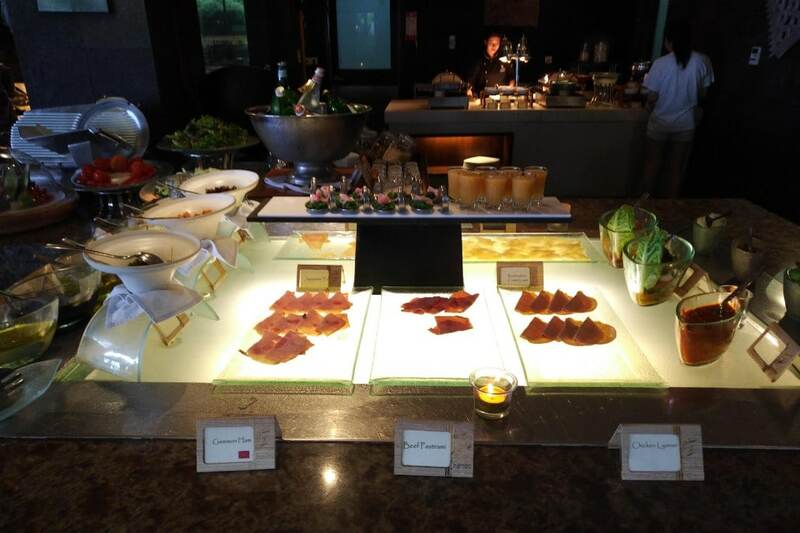 There were cold cuts, various Asian and Western hot items, a rotating chef station that served a pretty good beef pho, various pastries, fruit and cheese. 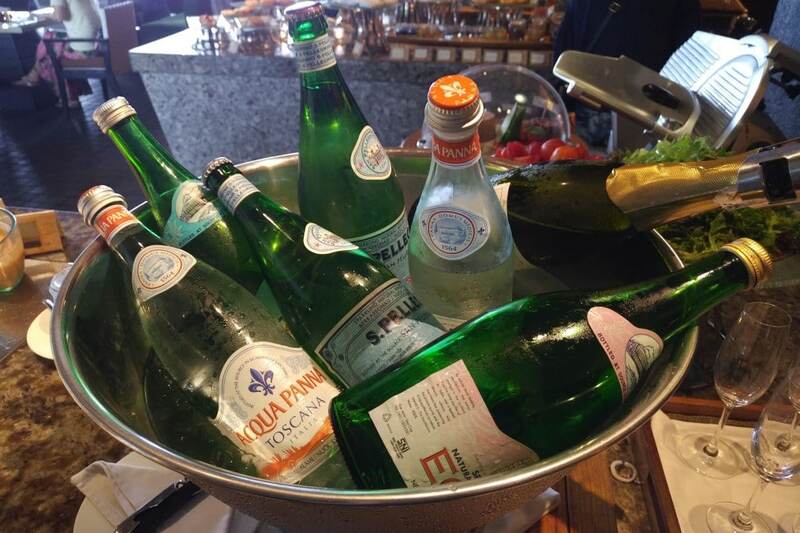 The buffet gets bonus points for having Acqua Panna water as well as a local sparkling rose available at breakfast. 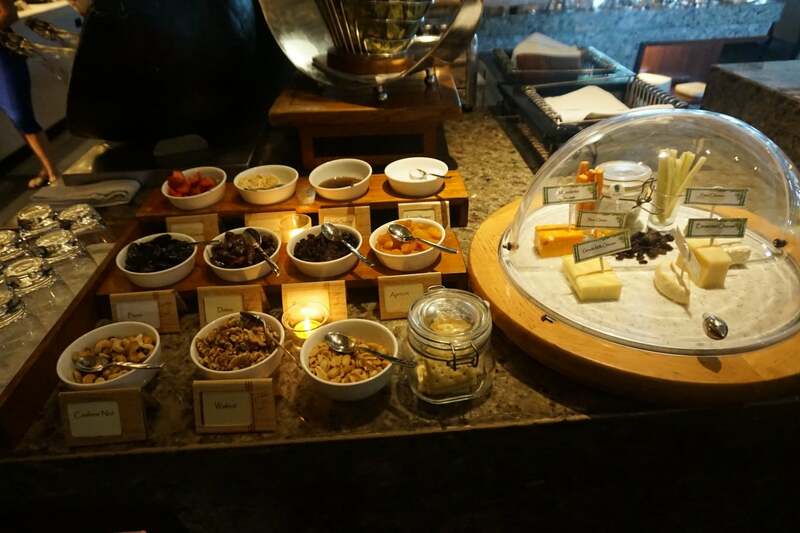 A unique feature of the Banyan Tree is that you could opt for what’s called a “floating breakfast”, for a 450K IDR (S$45) supplement. 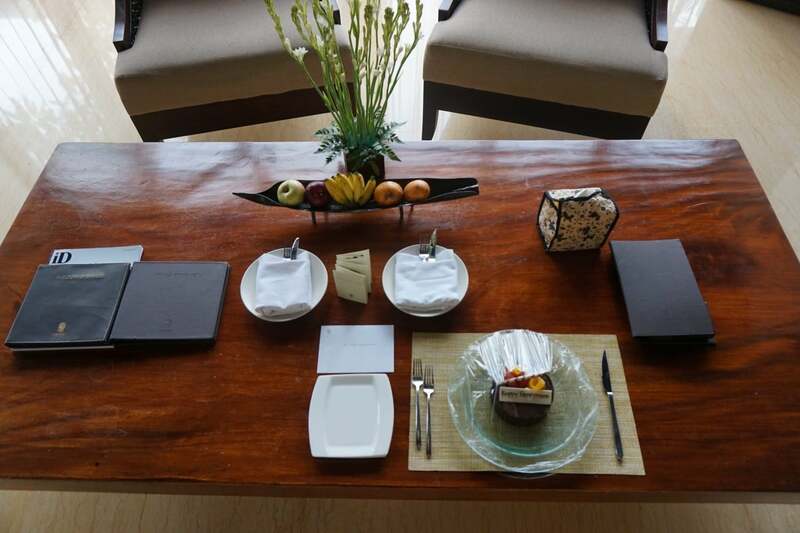 They’ll bring breakfast to your villa on a floating tray, and you’d have it in your private pool. I mean, I totally get the idea behind it. 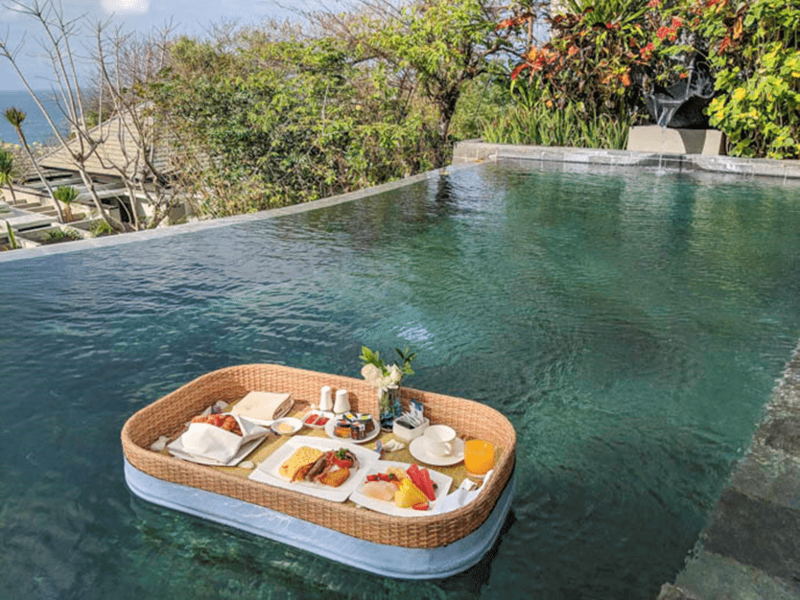 This would make the instaworthy vacation shot-having breakfast in the pool, in a private villa, in a bikini. Cue deluge of likes. I’d have considered doing it if it were free, but I just couldn’t bring myself to pay S$90 to eat the food we’d have got for free in the restaurant anyway. It’s a cute gimmick, but the price point was too steep. 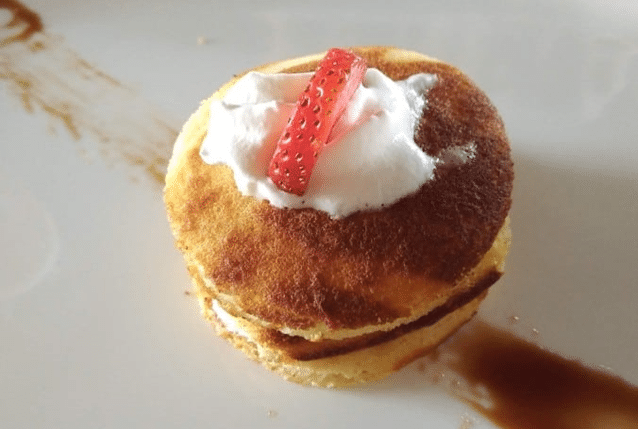 I’d read good reviews about Ju-Ma-Na and was excited to dine there on our first night. I suppose if I’d read the reviews more closely, I’d have seen that most of them praised the restaurant for its view rather than its culinary excellence. 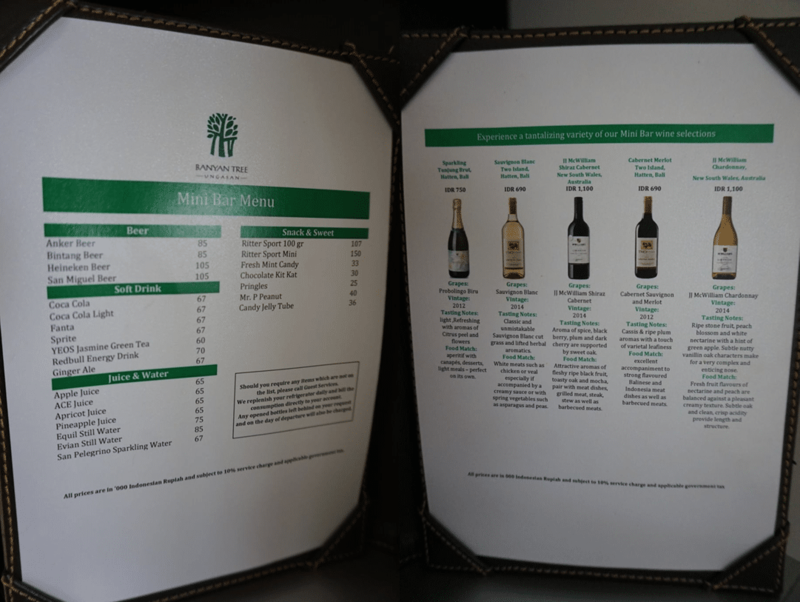 Here’a copy of the menu for your reference. Dinner started with an amuse bouche. 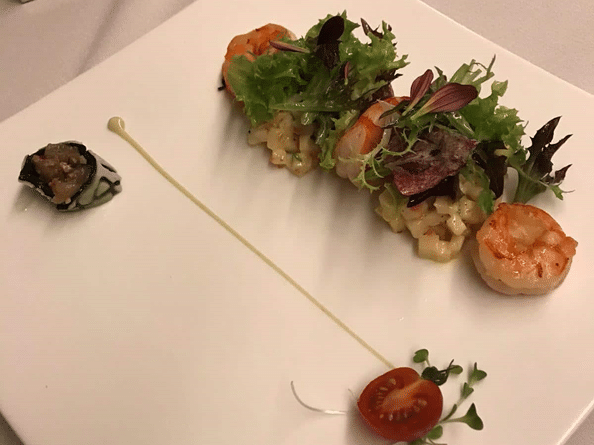 The grilled water prawns (IDR 310K, S$30) with jicama salad, wasabi aioli and citrus dressing were good, but for that price you’d really expect more than 3 small prawns. The other starter we tried was the hotate scallop (IDR 320K, ~S$31), featuring fresh marinated scallop, squid cannelloni and apple sauce. It was a…strange dish. 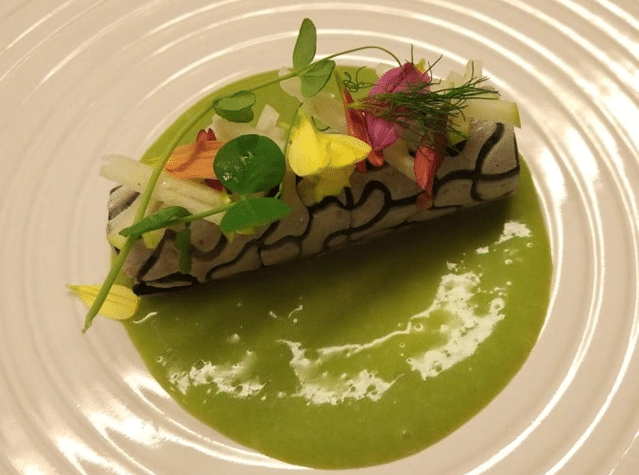 The squid cannelloni was sweet, not savory, and the addition of the apple sauce made the entire dish taste more like a dessert rather than a starter. 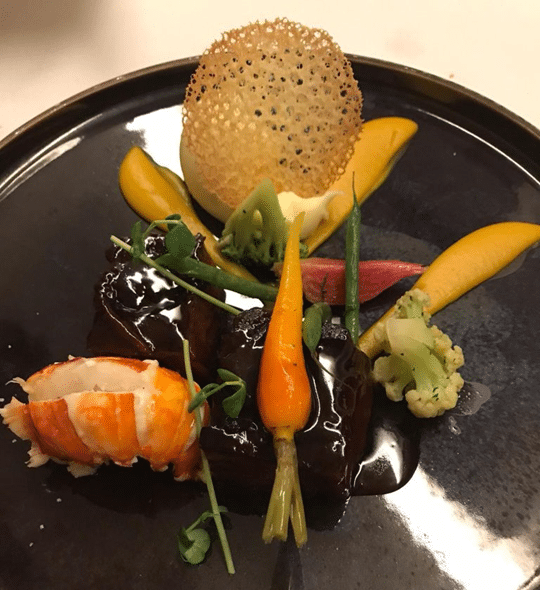 We decided to go for broke with the main by opting for the land and sea treats (IDR 695K, ~S$67), featuring butter poached lobster tail, ginger soya braised short ribs, fresh wasabi cream and honey glazed pumpkin. You can’t go wrong with lobster, and indeed the (small) tail served was sweet and tender. However, I thought the beef was ruined by the addition of an overly sweet glaze, which totally overpowered the beef. 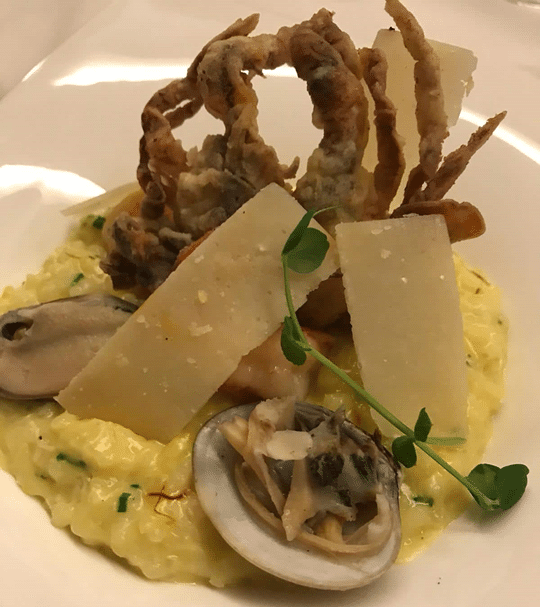 The Ju-Ma-Na seafood risotto with clams, blue river shrimp and scallop (IDR 525K, S$51) had way too much butter in it, making the whole dish overpoweringly cloy. The risotto was also overcooked, a pale shadow of the wonderful risotto we had just a night ago at Kayuputi. Small point: it appears they didn’t have river shrimp, so they substituted soft shell crab instead. I’m fine with either one, but best practice would have been to inform the guest beforehand. With our mains we ordered a side of sauteed organic vegetables (IDR 95K, ~S$9) and crispy mushrooms (IDR 85K, ~S$8.50). 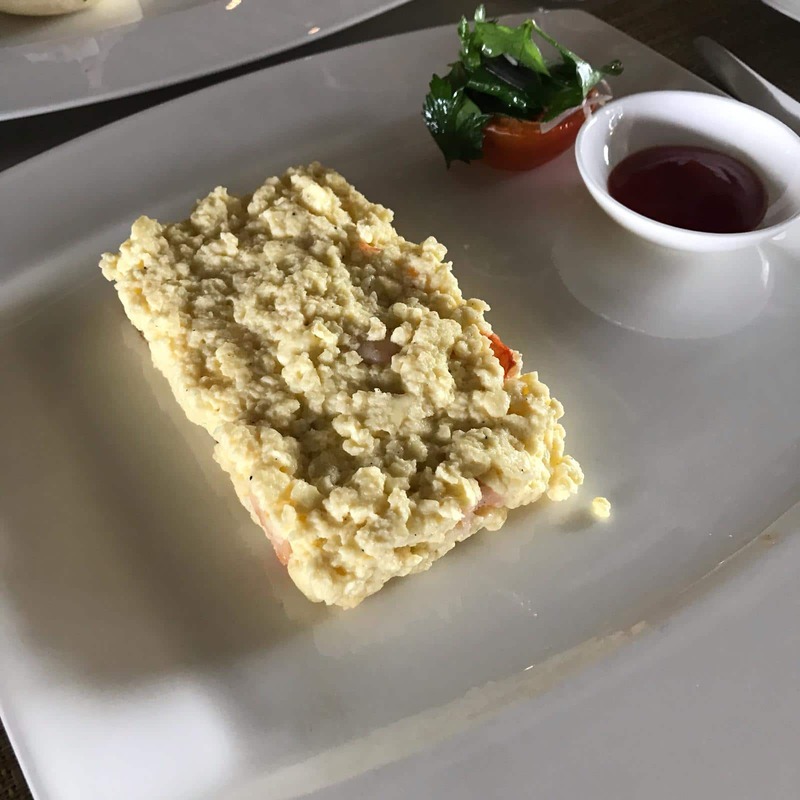 The vegetables were unmemorable, and again I suspect from the taste that the chef had gone heavy with the butter in the cooking. 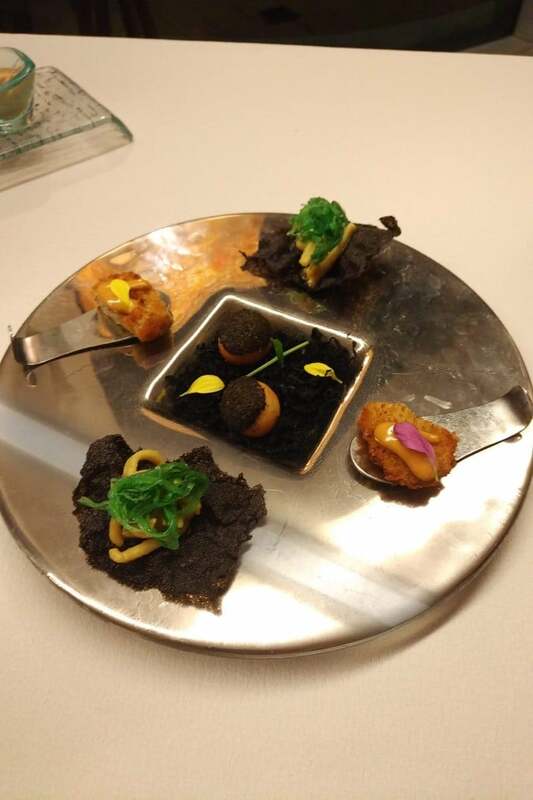 The mushrooms were actually very decent, fried crispy and served with nori powder. At ~S$260 for 2 people (with a $12 bottle of water, wow), Ju-Ma-Na was significantly more expensive than Kayuputi and didn’t taste anywhere near as good. I went away feeling quite ripped off, to be frank, and wish we’d just paid for a taxi and revisited Kayuputi instead. 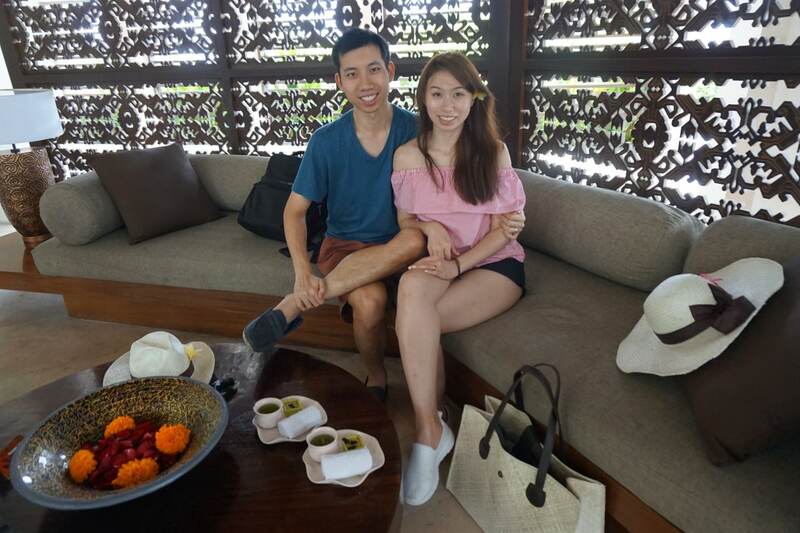 On the second night, we went to Jimbaran and had a lovely seafood dinner for two at Made Bagus that cost less than S$70 for two people. 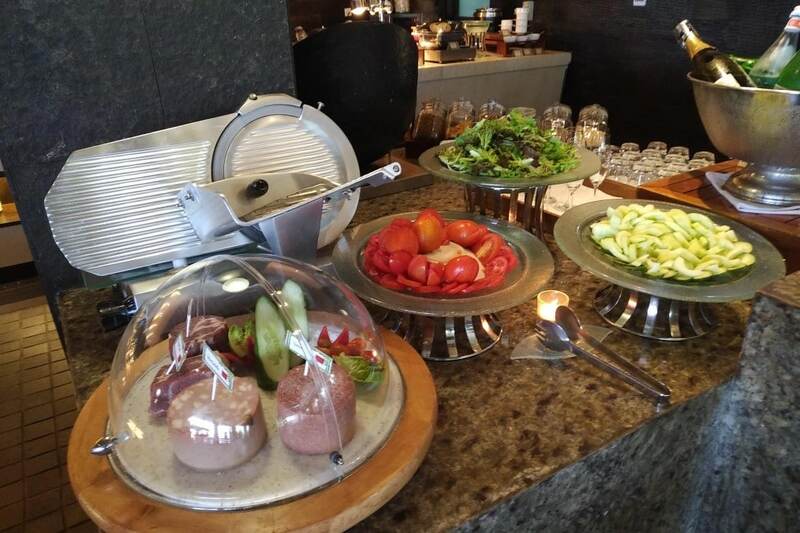 We did order room service both afternoons, and actually preferred that to any of the dishes we had in the restaurants. 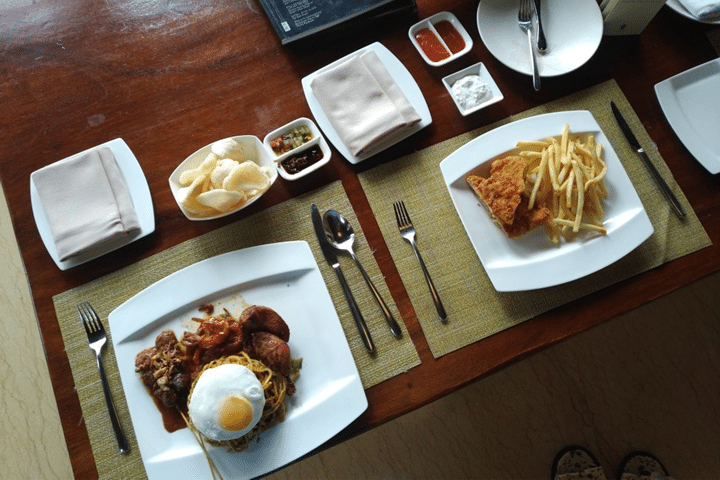 A mee goreng and schnitzel cutlet set us back about S$30, and were the perfect accompaniments to the bottle of champagne we brought with us to the jacuzzi. 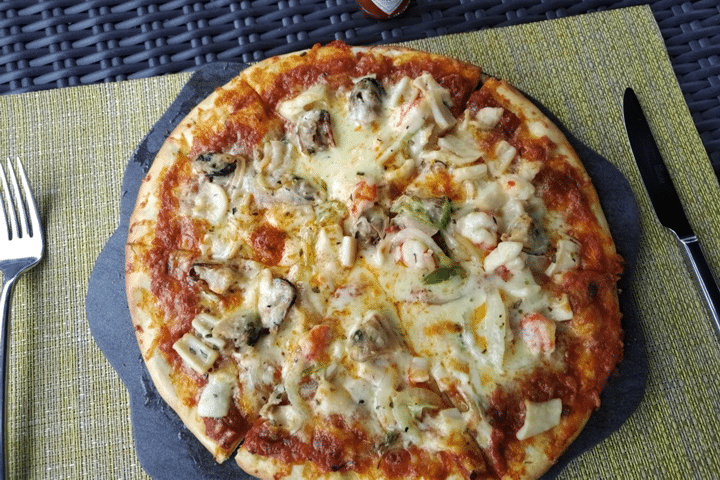 The seafood pizza was…just ok, but I’m kind of a snob about Italian food. 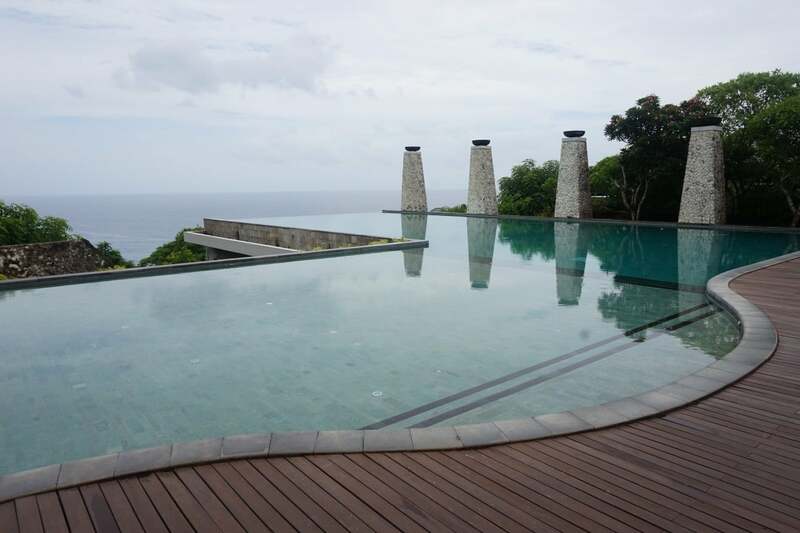 The Banyan Tree is blessed with an infinity pool that boasts an awesome view of the ocean. 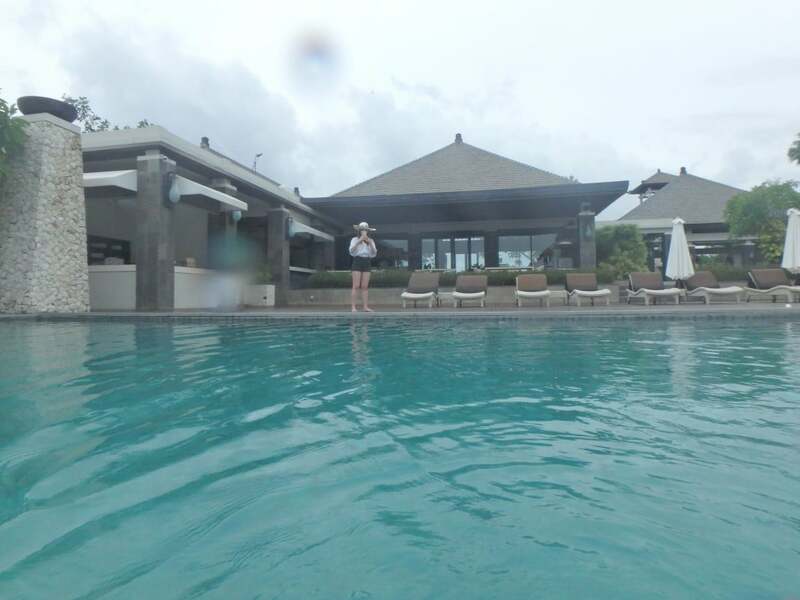 Thanks to the rainy weather, the pool was mostly empty during the duration of our stay. 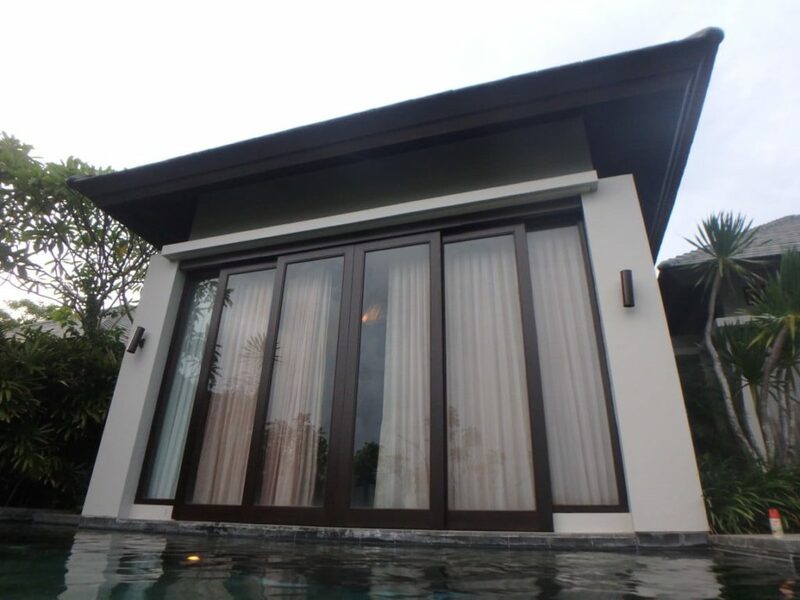 …but it costs 200K IDR (~S$20) to rent a small float, and 400K IDR (~S$40) to rent a big one. Given the prices you’re paying for the rooms here, and the fact that the pool was practically empty, it felt like an attempt to nickle and dime customers. 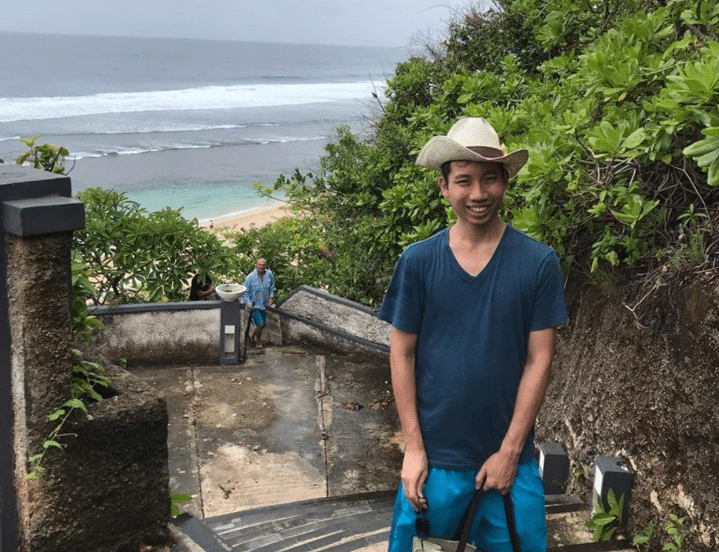 The Banyan Tree is located on a cliff, but it is possible to call for a buggy ride down to a staircase for beach access. What’s good is that the property keeps a pair of staff members positioned down at the beach all day to take care of guests. As soon as we arrived, we were greeted and escorted to a set of beach chairs and an umbrella. It had just rained, but they laid out towels and wiped the seats as much as they could. When we left, one of them radioed for the buggy which met us at the top of the stairs. The beach is nothing special, and it’s worth noting that it’s not a private facility so we did get approached by a couple of (non-pushy) touts, but if you’re really hankering to get near the sea then this is as good as it gets. 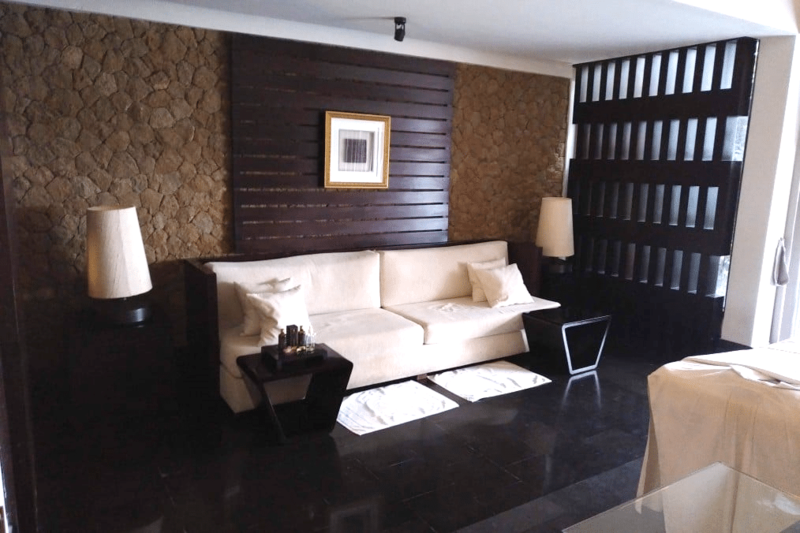 If you’re intending to book a spa treatment, you should do so before you arrive in order to take advantage of the 20% advance booking discount (10% if you’re booking a package). 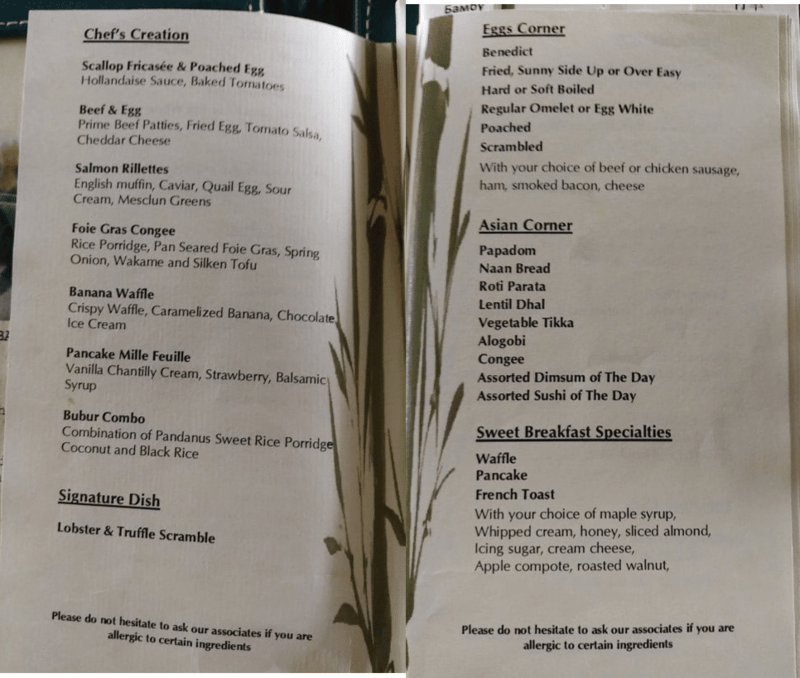 Here’s a copy of the spa menu for your reference. 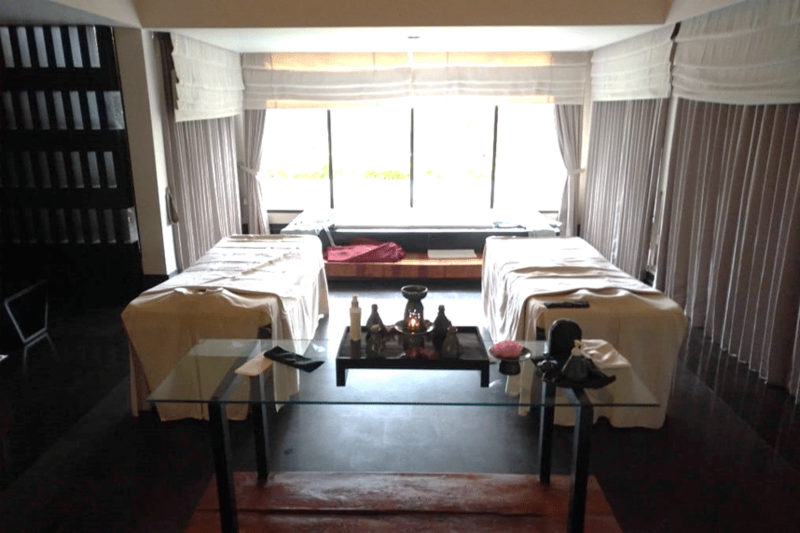 The Milelioness and I did a 60-minute treatment which came out to about S$100 per person after the discount. We thoroughly enjoyed the session, and the therapists were lovely. 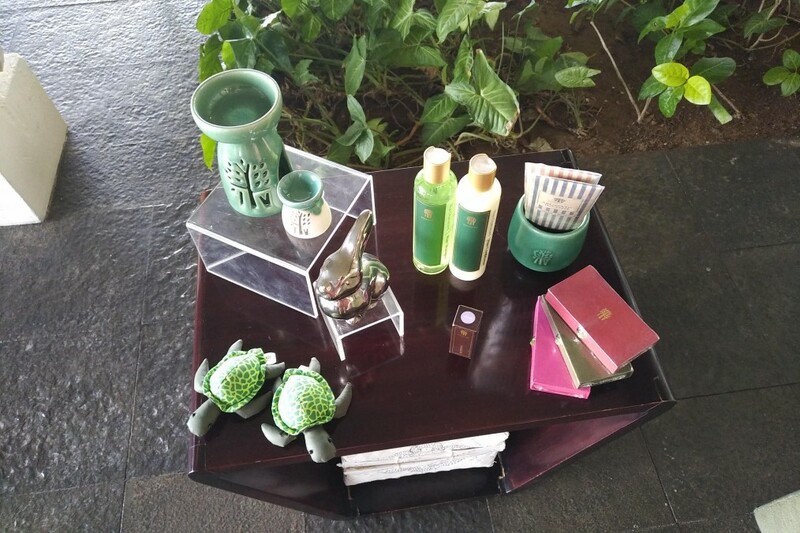 For those who have been to the Conrad Koh Samui, do those turtles below look familiar? 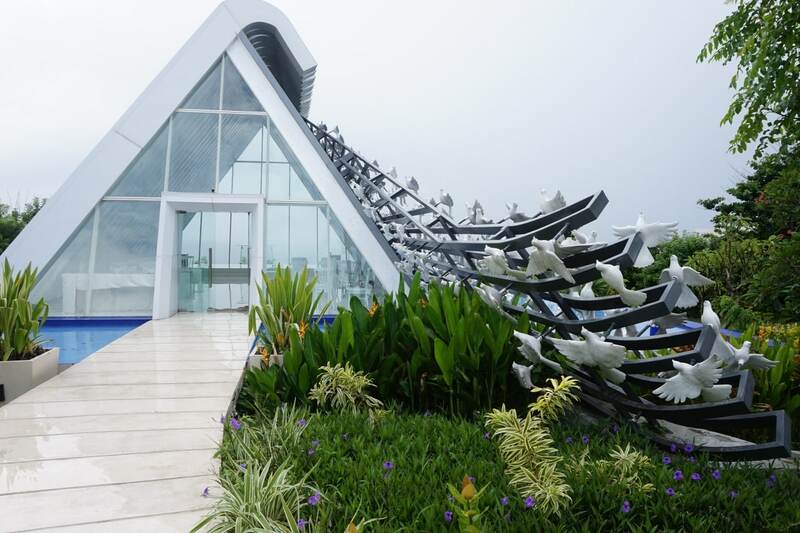 In case you’re planning on getting married in Bali, the Banyan Tree has a chapel called The White Dove. It’s got a nice view of the ocean, but needs a bit of TLC. The interior looked a bit run down when we visited. 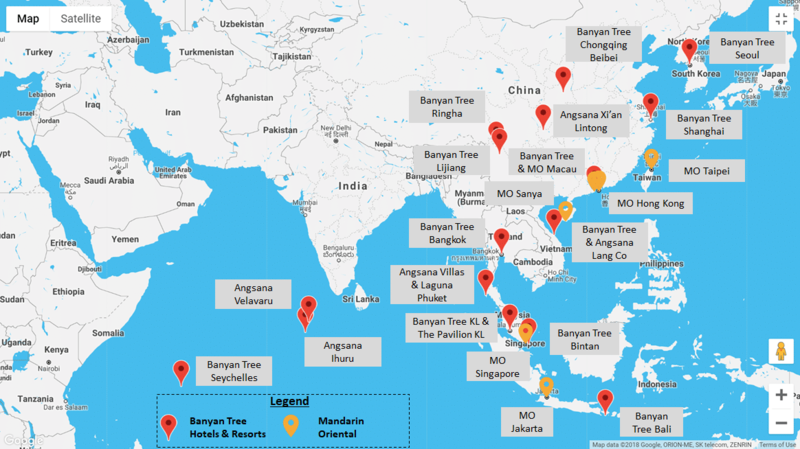 What did I make of the Banyan Tree Ungasan? 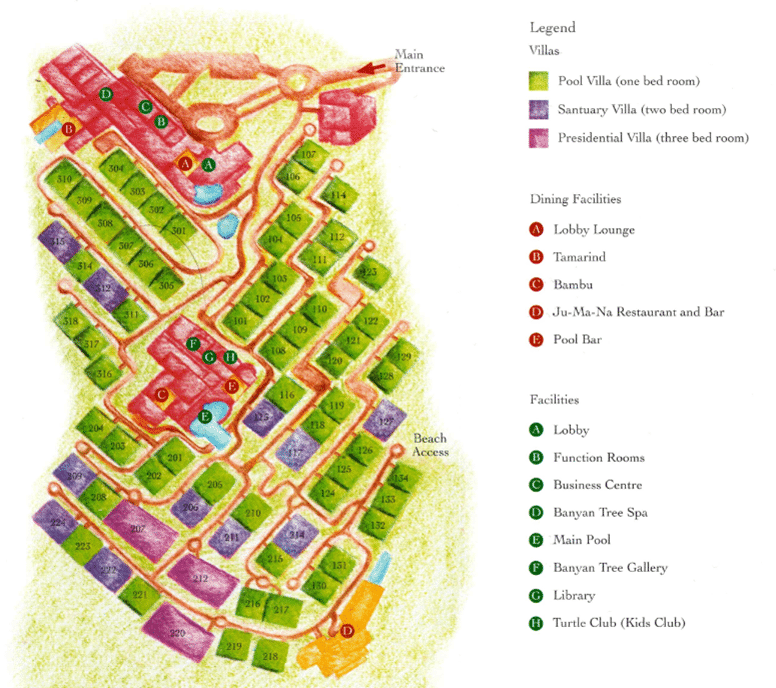 I actually thought that in terms of the hard product, the villas here had a slight edge over those at the St Regis. The interiors weren’t nearly as ornate, but the pool was much superior. 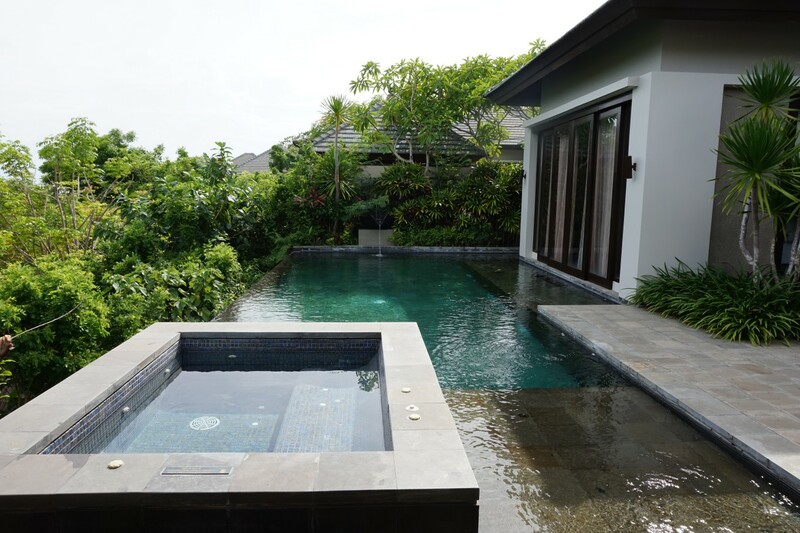 Sitting in the jacuzzi with a glass of champagne watching day turn into night was one of the more memorable experiences (assuming you’re able to avoid getting feasted on by mozzies), and nothing beats direct pool access. However, I felt the service at the St Regis was a lot more polished. 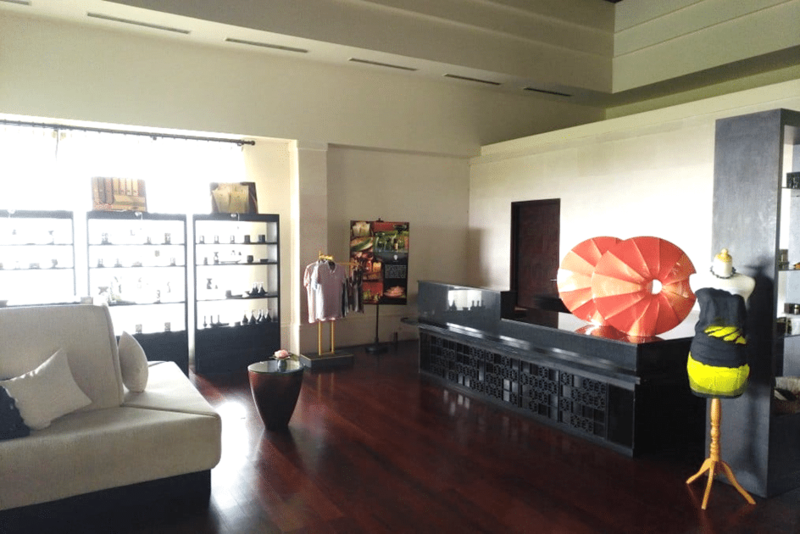 It wasn’t that the staff at Banyan Tree were bad by any means- in fact, they were always friendly and eager to help. 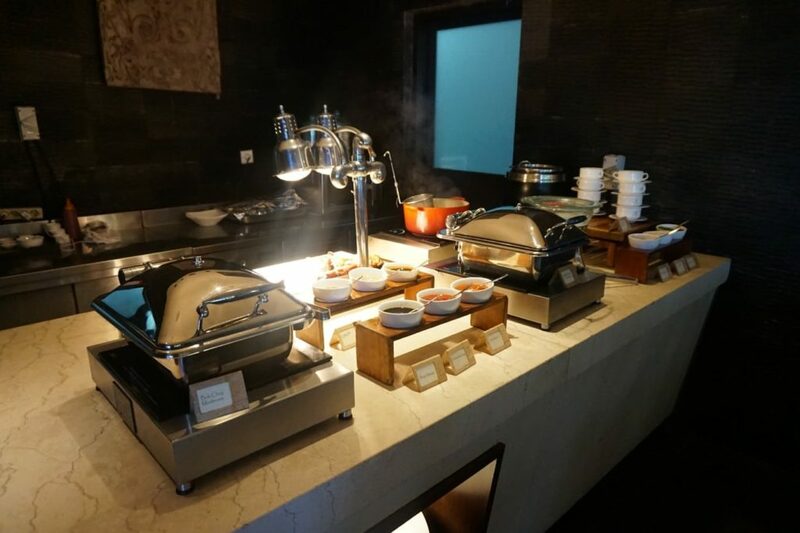 But the true mark of a great resort is one where staff know how to anticipate the needs of customers before they even ask. I’d have been much more impressed if they had done things like providing extra buggies when it rained (we had to wait upwards of 20 minutes sometimes), popping into villas to do cleaning when guests left for breakfast, remembering guests’ names and preferences, and proactively sending buggies to guest villas ahead of pre-set appointments with the spa or restaurants. 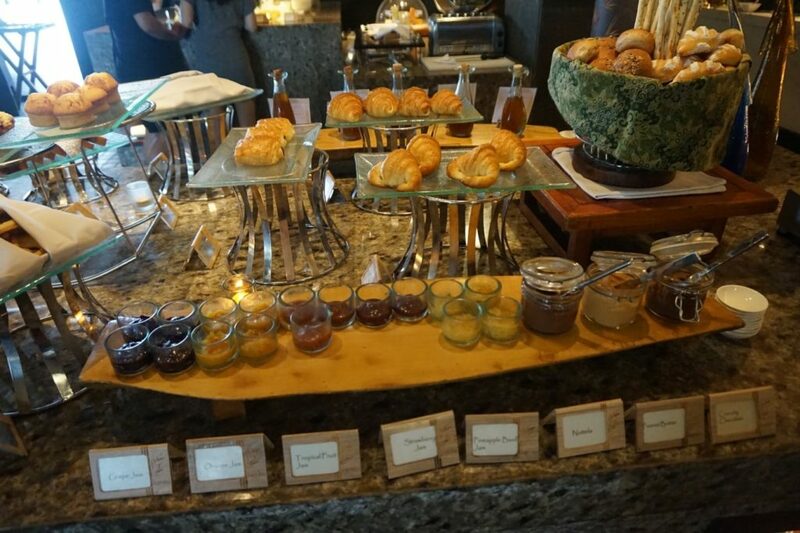 I feel like those are things the St Regis would have absolutely nailed, but at the end of the day it didn’t spoil the experience; it just made it less than what it could have been. I also felt that Ju-Ma-Na was poor value for money, and didn’t like that the hotel felt the need to charge for things like floats at the pool. 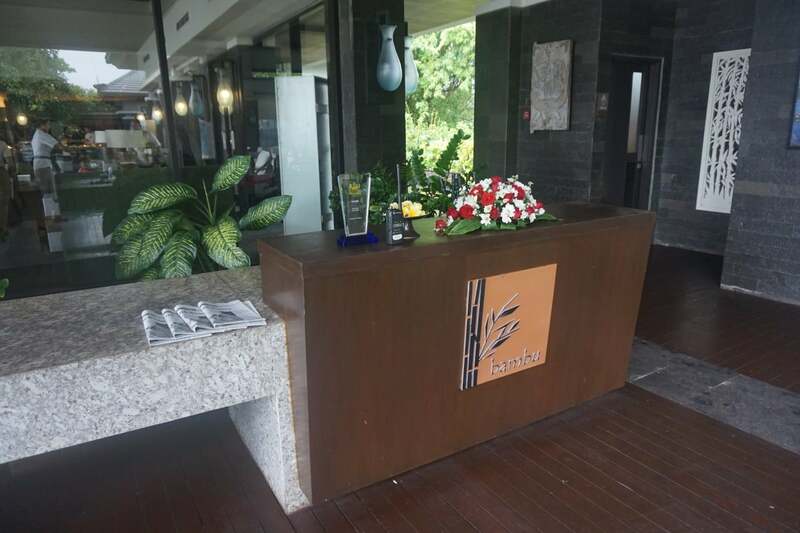 Is the Banyan Tree Ungasan a good resort? Yes. Is it a great one? Probably not. 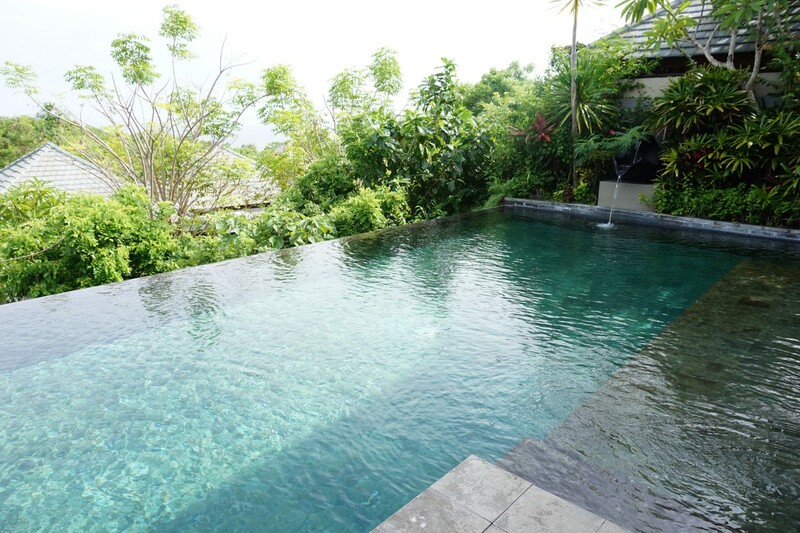 Perhaps if this were the only resort we stayed at during our Bali trip, we’d have been completely satisfied. But after the St Regis, it felt like a bit of a let down. OMG! The eggs! The ones at Macdonald’s look infinitely better! Unfortunately this has consistently been my experience with Banyan Trees to the extent I no longer stay with them. Never terrible – but for the eye watering price always below standard of comparable priced properties. Over priced and under standard. 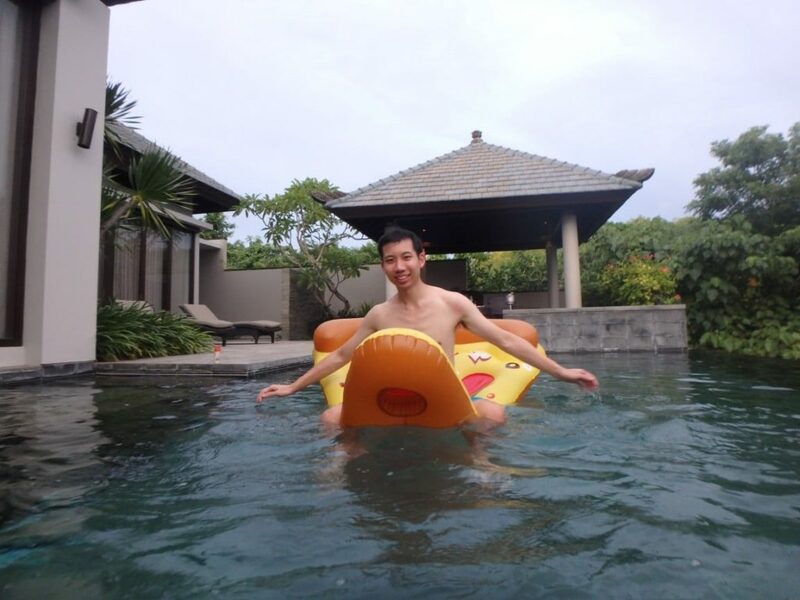 The picture of you riding your pizza reminds me of your Conrad Koh Samui TR. Thanks for the great review Aaron. Am I correct to assume that you did not have to pay extra for breakfast using the complimentary nights voucher. 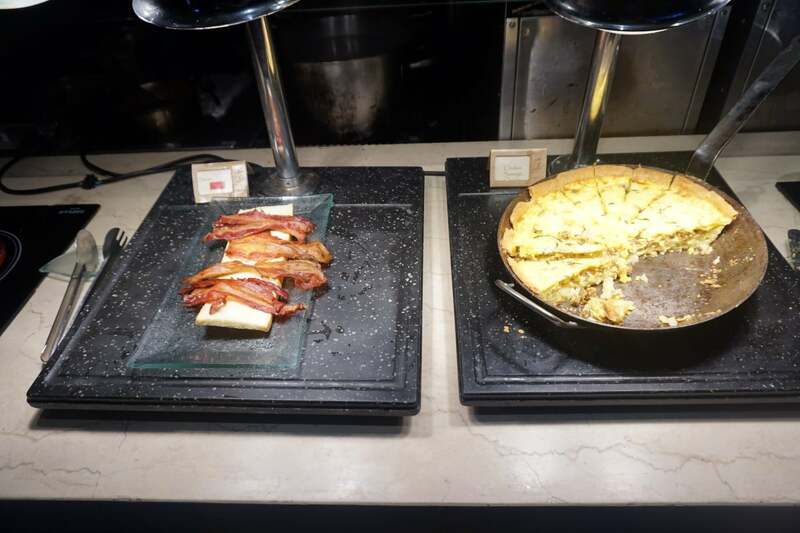 Is this vary property by property or does breakfast always provided? Would you have any idea on this please? 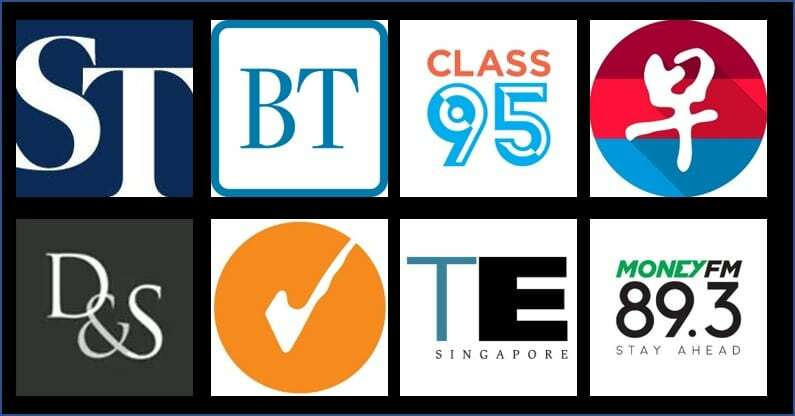 Planning to book on either MO HKG, MO Taipei or BT Seoul.